Globalization is a term referring to the integration of the world’s markets in goods and services, as well as flows of investment and people across national boundaries. Globalization has led to the prices of goods converging across countries, but much less so of wages. Nations tend to specialize in the production of the goods and services in which they are relatively low-cost producers, for example because of economies of scale, an abundance of the relevant resources or skills, or public policies. This specialization allows for mutual gains for the people of trading countries. Increased trade and specialization may benefit some groups within a country while harming others, for example, those producing goods that compete with imports. When evaluating government policy and international agreements, we may look at whether they fully exploit the mutual gains made possible, distribute those gains fairly, and reduce the economic insecurities involved in the globalization process. In December 1899, the steamship Manila docked in Genoa, Italy, and offloaded her cargo of grain grown in India. The Suez Canal had opened 30 years earlier, slashing the cost of moving agricultural commodities from south Asia to European markets. Italian bakers and shoppers were delighted at the low prices. Italian farmers were not. After a couple of months in Genoa, the Manila headed west. She carried 69 people in steerage (the cheapest possible passage), who were abandoning their homeland in search of a livelihood in the US. The low prices were made possible by a revolution in transportation and farming technology. As with the opening of the Suez Canal, the expansion of the railway system to the fields of North America, the Russian plain and northern India, and the development of steam-powered ships like the Manila, had cut the cost of transporting grain to distant markets. Across the vast plains of the American midwest, new strains of wheat, newly developed reapers and sowers, and improved drainage technologies had created a hi-tech, capital-intensive form of farming that was as productive as anywhere in the world. Across Europe, parliaments and state bodies struggled to adjust to the grain price shock. In France and Germany, farmers and their advocates prevailed. Despite the benefits of lower grain prices to families, and despite the protests of workers who consumed the grain, governments imposed tariffs to protect the incomes of farmers. Denmark, among other countries, responded differently. Instead of pro­tecting grain farmers from cheap imports, the government helped them to start dairy farming instead. Using cheap imported grain as an input, farmers responded to the incentives to produce milk, cheese, and other commodities that could not be transported cheaply over long distances. In turn, cheaper grain meant families could increase spending on these dairy products. In Italy, the children of some farmers took up jobs in the booming textile industry, which was exporting to the rest of the world. Many bankrupted farmers made the trip to the US. They slept on the decks of empty freighters that were returning to the US to pick up grain for Europe. About 750,000 Europeans made this voyage each year during the decade after the Manila’s visit to Genoa. Some of their grandchildren would end up as American farmers, growing grain in Kansas. In the European Union, the Common Agricultural Policy seeks to protect the agricultural sector for member countries. In the US, the most recent legislation supporting the sector is The Agricultural Act of 2014, known as ‘The Farm Bill’. There were big winners and big losers from the grain price shock. Many of the changes made economic sense. For example, the world’s grain was now grown increasingly in places where it could be produced most efficiently. But tariffs designed to protect the farmers of Germany and France held back this reallocation, preventing owners and workers in other sectors of the economy from enjoying lower grain prices. This continues to this day—rich countries still commonly protect their agricultural sectors through subsidies. The battle line was not between rich and poor, or landlords and tenants, or employers and employees. The conflict was between the producers of different commodities. Those involved in manufacturing welcomed the expansion of trade with the US, while those farming grain did not. Globalization is the word commonly used to describe our increasingly interconnected world. This term refers not only to the trade in grain and migration across national borders illustrated by the Manila, but also to non-economic aspects of international integration, such as the International Criminal Court, the flow of ideas across borders, or our increasingly similar taste in music. In Unit 6, we looked at firms like Apple that choose to produce their goods in other parts of the world where costs are lower. This offshoring is an important dimension of globalization, and it can involve outsourcing production to other companies, or it can take place within the boundaries of a multinational company. For example, Figure 18.1 shows that the Ford Motor Company operates offices or plants in 22 countries outside the US. The company started offshoring a year after it was founded, first in Canada in 1904, and began manufacturing in many other countries soon after­wards, for example in Australia (1925) and even the Soviet Union (1930). In 2016 this ‘American’ company had 201,000 employees, 144,000 of them located outside the US. Ford employees across the world in 2014. Figure 18.1 Ford employees across the world in 2014. In the case of a multinational company, owners, managers and employees in many countries have become part of the same unified, transnational struc­ture. This is because the costs of doing business within the company are low­er than the costs of doing business with other companies. But, as we saw with the cotton market in Units 8 and 11, globalization not only involves the integ­ration of firms in different countries; it involves the integ­ration of markets themselves, bringing sellers and buyers in different countries closer together. Exchange involves the possibility of mutual gains and also conflicts over how these gains will be distributed. The resulting outcomes may not be Pareto efficient (there may be technically feasible mutual gains that remain unrealized). The resulting distribution may seem unfair in the eyes of many. Well-designed government policies can improve the efficiency or fairness of the outcomes. Imposition of tariffs: These are taxes on imports that effectively discriminate against goods produced in other countries. Immigration policies: Governments regulate the movement of people between nations in a way that would not be possible (or acceptable) within most nations. Capital controls: Limits on the ability of individuals or firms to transfer financial assets among countries. Monetary policies: They affect the exchange rate, and so alter the relative prices of imported and exported goods. While national boundaries give governments additional policy tools, they also limit the reach of governments. Within a nation, governments generally succeed in protecting private property rights where these exist, and in enforcing contracts. Because there is no world government (and international agencies are often weak), enforcing contracts and protecting property rights globally is sometimes impossible. This raises controversial questions about the fairness of the distribution of mutual gains from exchange. The conflicting interests sometimes coincide with national differences between poorer and richer economies. It is tempting, though often inaccurate as we will see, to consider these conflicts as ‘us’ at home versus ‘them’ abroad. In this unit, we will consider three markets that became more integrated with globalization: international markets for goods and services (trade), international labour markets (migration), and international capital markets (international capital flows, which are flows of savings and investment). The trade in goods, sometimes called merchandise trade, concerns tangible products that are physically shipped across borders by road, rail, water, or air. Trade of this sort has been happening for millennia, although the nature of the goods traded, and the distances over which they have been shipped, have changed dramatically. Trade in services is a more recent phenomenon, although it has also been occurring for centuries. Services that are commonly traded across borders are tourism, financial services, and legal advice. Many traded services make merchandise trade easier or cheaper—for example, shipping services, or insurance and financial services. The UK became the leading provider of these services during the nineteenth century, when it was the most advanced industrial economy, the major naval and imperial power, and the most important trading nation. Nowadays, countries also export educational services (for example, people travel from all over the world to study in US or European universities), consulting services, and medical services. India has become a major exporter of software-related services. For example, the ebook for the CORE project was initially developed in Bangalore. We will study these service exports together with merchandise trade, since the same principles can help us to understand them. How can we measure the extent of globalization in goods and services? One approach would simply be to measure the amount of trade in a country or region, or the world as a whole, over time. If it increased, we conclude that the country, region or the whole world was becoming more globalized. It is common to measure trends in the share of imports, exports, or total trade (imports plus exports) in GDP as an indicator of globalization, so as to take account of the growth of GDP as well as trade. Figure 18.2 shows world merchandise exports (which excludes services), expressed as a share of world GDP, between 1820 and 2011. The share rose by a factor of 8 between 1820 and 1913, from 1% to 8%. In 1950, the share was lower (5.5%) but recovered rapidly during the prosperous postwar period. It reached 10.5% in 1973, 17% in 1998, and 26% in 2011. In the long run, the trend has clearly been upwards, with a sharp acceleration from the 1990s onwards. 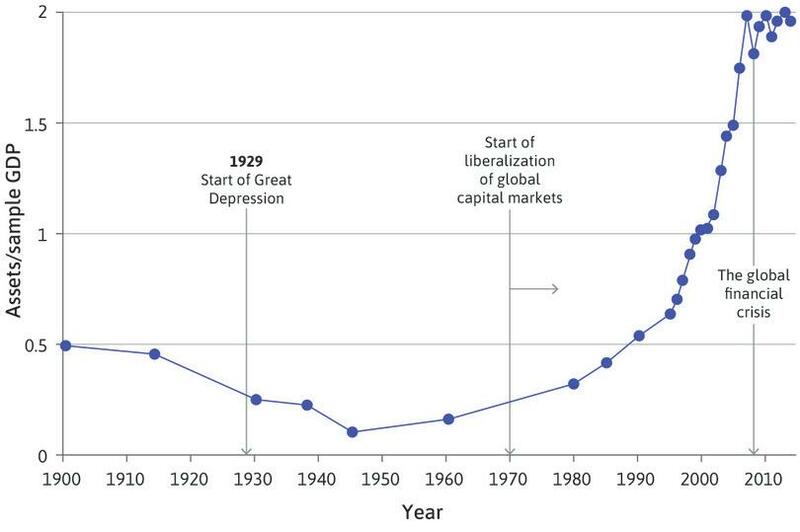 However, this trend was interrupted between 1914 and 1945, which included two world wars and the Great Depression. World merchandise exports as a share of world GDP (1820–2011). Figure 18.2 World merchandise exports as a share of world GDP (1820–2011). (1) Appendix I in Angus Maddison. 1995. Monitoring the World Economy, 1820–1992. Washington, DC: Development Centre of the Organization for Economic Co-operation and Development; (2) Table F-5 in Angus Maddison. 2001. The World Economy: A Millennial Perspective (Development Centre Studies). Paris: Organization for Economic Co-operation and Development; (3) World Trade Organization. 2013. World Trade Report. Geneva: WTO; (4) International Monetary Fund. 2014. World Economic Outlook Database: October 2014. A second method is to measure the additional costs associated with exporting goods relative to selling them domestically. When the costs of trading between countries fall, then in economic terms, the world has shrunk. It is as if countries were closer. In Unit 8, you learned about Alfred Marshall and his model of supply and demand. We saw that the law of one price holds in markets with many potential buyers and sellers, where all goods are identical and where buyers and sellers are aware of all trading opportunities. But this assumes that it is costless to take advantage of those trading opportunities. If, on the other hand, trading between markets in two countries is costly because of transport costs, trade barriers, or other factors, then there is no reason to suppose that prices will be the same in both. Consider the market for a good that is produced in (and exported from) one country and consumed in (and imported into) another. Let’s use the example of Japan exporting cars to the US. To keep the analysis straight­forward, imagine that these are the two only countries in the world, that the Japanese do not consume cars, and that the US does not produce any cars itself. This means that everything that is produced is traded. The blue line in Figure 18.3 represents the supply curve in Japan: it is an upward-sloping function of the price in Japan. The red line represents the demand curve in the US. It is a downward-sloping function of the price in that country. Let t be the cost of shipping a car from Japan to the US, including all transportation costs, trade taxes and so on. If the market is competitive, then the total cost of obtaining a car in the US will be the cost of buying it in Japan, plus the trade cost t. t is a measure of the price gap between cars in Japan and cars in the US. Follow the analysis in Figure 18.3 to see how changes in trade costs are reflected in price gaps. The market for cars: Price gaps reflect trade costs. 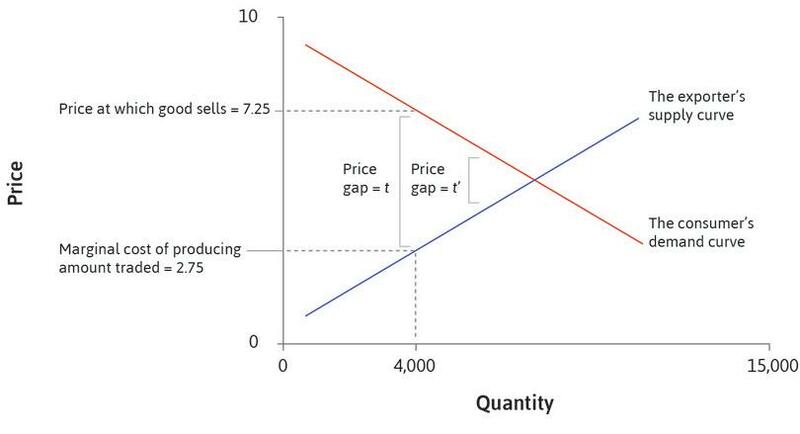 Figure 18.3 The market for cars: Price gaps reflect trade costs. The blue line represents the supply curve in the producing (exporting) country, which is Japan. It is an upward-sloping function of the price in that country. Figure 18.3a The blue line represents the supply curve in the producing (exporting) country, which is Japan. It is an upward-sloping function of the price in that country. The red line represents the demand curve in the consuming (importing) country, which is the US. It is a downward-sloping function of the price in that country. 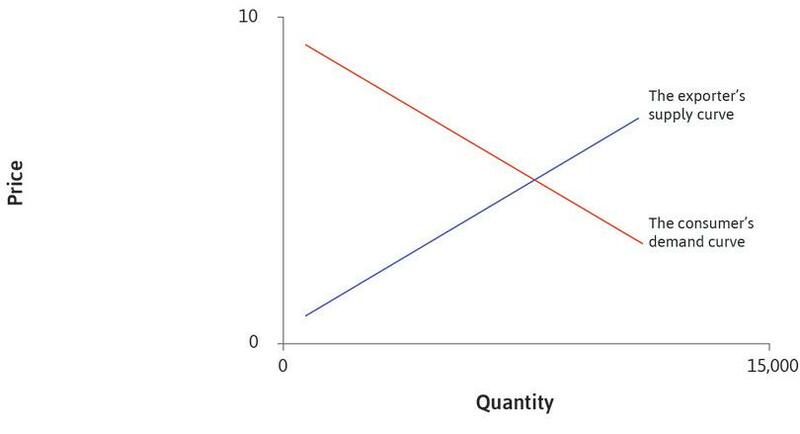 Figure 18.3b The red line represents the demand curve in the consuming (importing) country, which is the US. It is a downward-sloping function of the price in that country. If the market is competitive, then the price of the car in the US will be the cost of buying it in Japan, plus the trade cost t. Let us assume that the cost of shipping a unit of the good is 4.5. We will show that 4,000 cars will be produced. Figure 18.3c If the market is competitive, then the price of the car in the US will be the cost of buying it in Japan, plus the trade cost t. Let us assume that the cost of shipping a unit of the good is 4.5. We will show that 4,000 cars will be produced. Because at that quantity, the difference between the supply curve and the demand curve is equal to the trade cost, 4.5. The marginal cost in Japan will be 2.75, while the customers in the US are willing to pay 7.25 per unit. 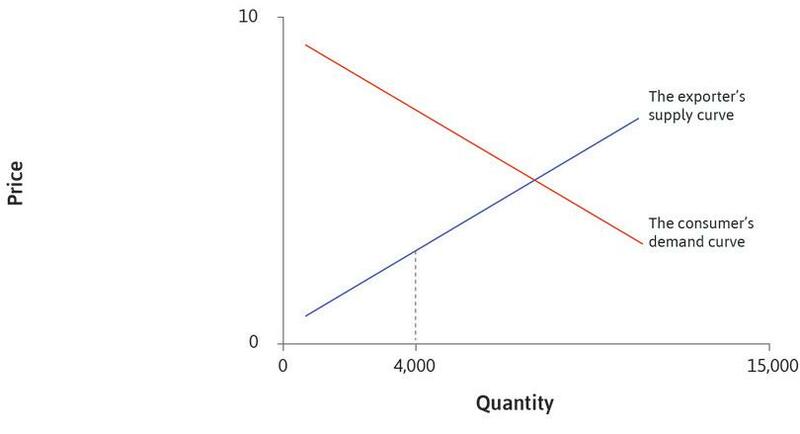 Figure 18.3d Because at that quantity, the difference between the supply curve and the demand curve is equal to the trade cost, 4.5. The marginal cost in Japan will be 2.75, while the customers in the US are willing to pay 7.25 per unit. If we think of globalization as a process, then a world that is becoming more globalized is one in which trade costs are falling. In the figure, this is represented by a decline in trade costs from t to t′. Figure 18.3e If we think of globalization as a process, then a world that is becoming more globalized is one in which trade costs are falling. In the figure, this is represented by a decline in trade costs from t to t′. As can be seen, falling trade costs imply a decline in the price gap between the import price and the export price, and an increase in the number of cars traded from 4,000 to 6,000. Figure 18.3f As can be seen, falling trade costs imply a decline in the price gap between the import price and the export price, and an increase in the number of cars traded from 4,000 to 6,000. In the right circumstances, globalization can benefit both exporting producers and importing consumers. It does so by bringing them closer together, and it leads to an increase in both the supply of exports and the demand for imports. The concept of arbitrage explains why the price gap should tend to equal the sum of all trade costs. By buying at a low price in export markets and selling at a higher price in import markets, traders can make a profit as long as the price gap is higher than the total costs of trade. When traders engage in arbitrage in this fashion, they lower the supply of the good in the export market, driving up its price, and they increase the supply of the good in the import market, lowering its price. Both of these effects cause the price gap to decline. This should continue until price gaps have been driven down to the trade cost, and further arbitrage is unprofitable. A high price gap reflects a world in which trade is expensive and globalization is limited. A low price gap, on the other hand, reflects a much more globalized world in which trade is cheap. Globalization should lead to falling import prices: But if we observe falling import prices, this does not necessarily mean that globalization is occurring. The demand for the good in question may simply have declined (or the supply may have increased). Globalization should also lead to rising export prices: But rising export prices do not necessarily imply globalization. Demand for the good in question may simply be rising (or the supply may have declined). Declining price gaps between importing and exporting countries are a much surer sign of globalization: This is particularly true if we can also observe rising trade volumes. For example, Figure 18.4 shows unmistakable evidence of declining transatlantic trade costs during the nineteenth century. 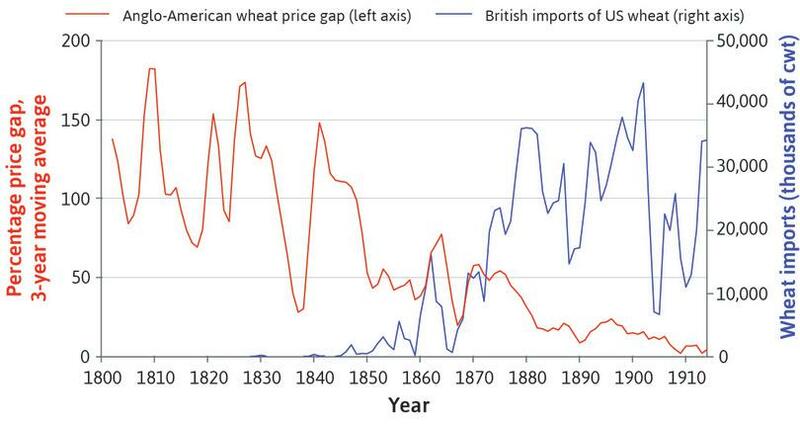 The wheat price gap between the UK and the US (expressed as a percentage) fluctuated wildly before 1840 or so, around a roughly constant trend. It then started to decline at about the same time that shipping costs started to fall, a result of the introduction of steamships on long-distance routes. The price gap had almost vanished by 1914. At the same time, the volume of wheat shipped across the Atlantic rose dramatically. The Anglo-American wheat trade (1800–1914). Figure 18.4 The Anglo-American wheat trade (1800–1914). Figure 3 in Kevin H. O’Rourke and Jeffrey G. Williamson. 2005. ‘From Malthus to Ohlin: Trade, Industrialization and distribution since 1500’. Journal of Economic Growth 10 (1) (March): pp. 5–34. The transatlantic trade in wheat is not an isolated example. International price gaps fell sharply on many routes and for many commodities between 1815 and 1914, the first epoch of modern globalization. Figure 18.5 gives ‘American-Anglo’ price gaps (the reverse of Figure 18.4) for a variety of commodities between 1870 and 1913. For agricultural commodities such as wheat and animal products, British prices were higher than American ones, so the price gaps are the percentage by which the British price exceeded the American price. In the case of industrial commodities such as cotton textiles or iron bars, American prices were higher than British ones, so the price gaps quoted are the percentage by which prices in Boston or Philadelphia exceeded prices in Manchester or London. In nearly all cases price gaps fell (sugar is the outstanding exception), indicating that transatlantic commodity markets were becoming better integrated. Much like the dramatic reduction in grain prices in Genoa after the opening of the Suez Canal, which we discussed in the introduction to this unit, price gaps between the US and the UK reduced over time because of a revolution in transportation and improvements in farming and production technology. This is hardly an isolated example. There exists evidence of similar convergence for Liverpool-Bombay cotton, London-Calcutta jute, and London-Rangoon rice prices. Commodity price gaps between the US and UK (1870–1913). 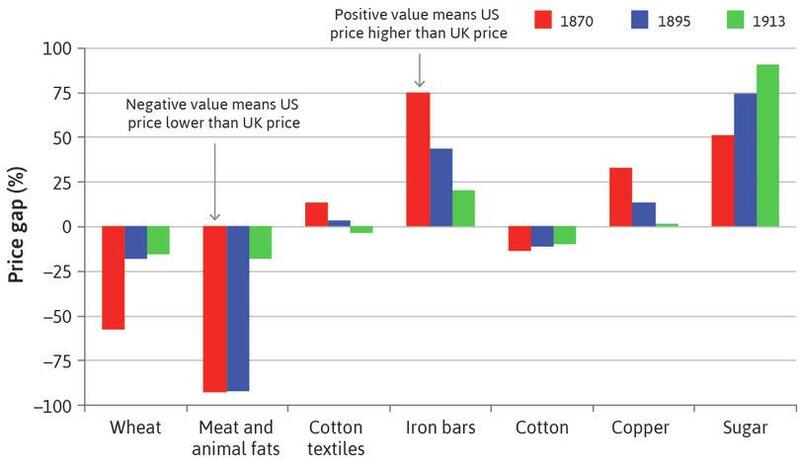 Figure 18.5 Commodity price gaps between the US and UK (1870–1913). Table 2 in Kevin O’Rourke and Jeffrey G. Williamson. 1994. ‘Late Nineteenth-Century Anglo-American Factor-Price Convergence: Were Heckscher and Ohlin Right?’ The Journal of Economic History 54 (04) (December): pp. 892–916. Railways were probably even more important than steamships in integrating global commodity markets. Without them, it would have been prohibitively expensive to ship grain and other goods to and from the interior of continents and coastal seaports. Where price gaps fell less sharply during the late nineteenth century, this was often because of tariffs—taxes on imports—which were rising in several countries for reasons that we will discuss later, and which counteracted the effects of declining transport costs. Transatlantic shipments of wheat fell after 1914, and price gaps rose, suggesting a rise in trade costs and therefore deglobalization. 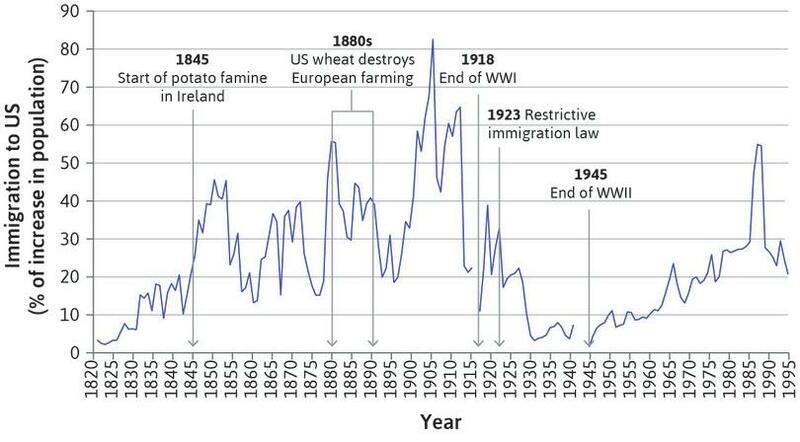 International price gaps rose during the interwar period for many agricultural commodities, because governments raised tariffs in response to unemployment and economic insecurity. When a country undertakes protectionist policies, its government is taking steps to limit trade, in particular by reducing the amount of imports coming into the economy. This is often done to protect domestic industries against foreign competition (hence protectionism), but it also means consumers have to pay more for imports. Protectionist measures include taxes to raise the domestic price of imports (a tariff) and quantitative restrictions on imports (a quota). 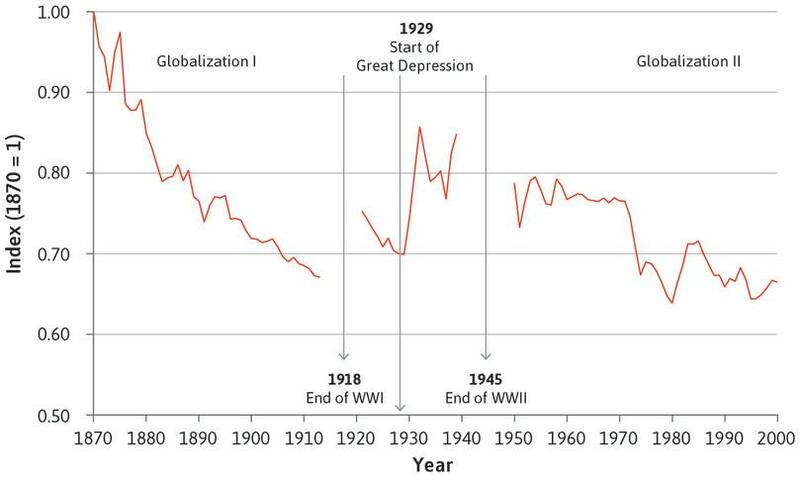 The post-1945 period was one of ‘reglobalization’, which began slowly but then accelerated, especially after 1990. Agricultural markets were largely protected for much of the period, and there is no reason to suppose that international price gaps for agricultural commodities fell sharply. The markets for industrial goods and components, on the other hand, were liberalized, and several studies have found evidence of declining international price gaps in the late twentieth century. Economists have measured trade costs indirectly, by looking at trade between pairs of countries. This shows the long-term changes in impediments to trade, and can separate the effects of distance between the countries from national policies of those countries. If trade between Germany and France, for example, increased from one year to the next, but it did not increase between these two countries and their other trading partners at the same time, we can interpret this as an indirect measure of declining trade costs for this pair of countries. If we sum total trade costs each year for all major economies, we have an indicator of the process of globalization. Figures 18.6 and 18.7 do this for the period 1870 to 2000. Figure 18.6 Impediments to trade (1870–2000). David S. Jacks, Christopher M. Meissner, and Dennis Novy. 2011. ‘Trade Booms, Trade Busts, and Trade Costs’. Journal of International Economics 83 (2) (March): pp. 185–201. Note: Presented as an index, with 1870 = 1. Trade costs declined substantially from 1870 to 1913, reflecting declining transport costs and reductions in tariffs. Trade costs then rose in the interwar period because of rising tariffs. This was particularly the case following the onset of the Great Depression in 1929: countries attempted to solve unemployment problems by discouraging imports. From 1970, trade costs started to fall worldwide again as countries began to reliberalize trade, and transport technologies improved. Tariffs tend to be higher in low-income countries than in rich countries, in part because alternative methods of raising government revenue such as the income tax are difficult to administer in developing countries. As Figure 18.7 shows, however, most countries have reduced their tariffs in recent decades. The price evidence therefore suggests interrupted commodity market integration over the past 150 years. Nineteenth century integration was briefly reversed, followed by reintegration after the Second World War. We call these two periods of integration Globalization I and Globalization II. Average tariff rates, per cent (1981–2010). Figure 18.7 Average tariff rates, per cent (1981–2010). The World Bank. 2011. ‘Data on Trade and Import Barriers’. Note: 3-year centred moving average. 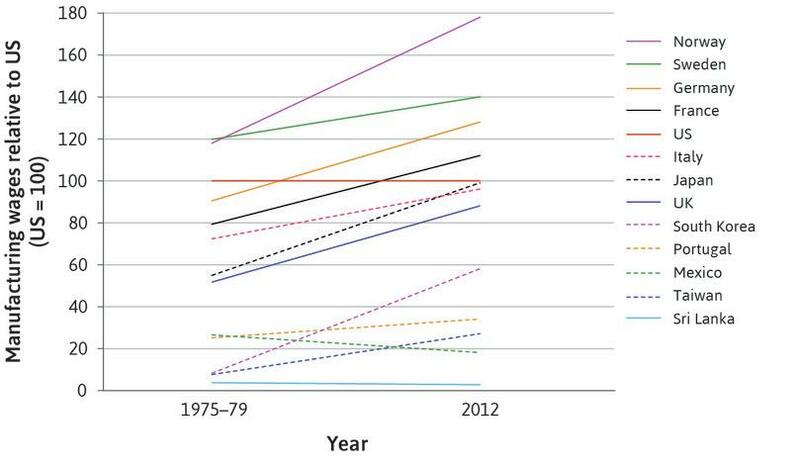 Figure 18.5 shows the price gap of different commodities between the US and UK over time. Can you think of a reason why price gaps for meat and animal fats such as butter did not start to fall until 1895? Propose an explanation for the smaller price gaps and the more rapid fall for copper as compared with iron ore. What might account for the increase in the price gap for sugar? Download the data set, ‘Trends in average MFN applied tariff rates in developing and industrial countries, 1988–2016’, by going to the World Bank website and clicking ‘EXCEL’ (listed under the Download section on the right). This data was used to produce Figure 18.7. Choose one country from each income category (high, low, lower middle, upper middle) and plot the evolution of tariffs in these four countries. Use your plots to describe how tariffs in your chosen countries have changed over time. Evidence from other studies suggests that on average, tariffs tend to be higher in lower-income countries than in high-income countries, but that most countries have reduced tariffs substantially in recent decades. Do your plots support this claim? Suggest an explanation for some of the observed differences between your chosen countries (if any). (As a starting point you may want to consider your chosen countries’ membership of global trade agreements such as GATT/WTO or the EU, and also whether the country has followed the structural adjustment programs of the IMF). Figure 18.3 depicts the supply curve in the exporting country and the demand curve in the importing country in a market for a traded good. Assume that the good is produced exclusively in the exporting country and consumed exclusively in the importing country. At quantity 4,000, the price received by the producers is 7.25. At quantity 6,000, the price paid by the consumer is 4. The price gap represents the trade costs, such as transportation costs and trade taxes. Increasing the quantity sold to 6,000 causes the price gap to fall to 2. The price received by the producers is the price paid minus the trade costs. At quantity 4,000, this is 2.75. The price paid by the consumers at quantity 6,000 is 6. Due to arbitrage, the price difference must represent trade costs. The causality is the other way round. If the trade costs were 2, the quantity traded would be 6,000. 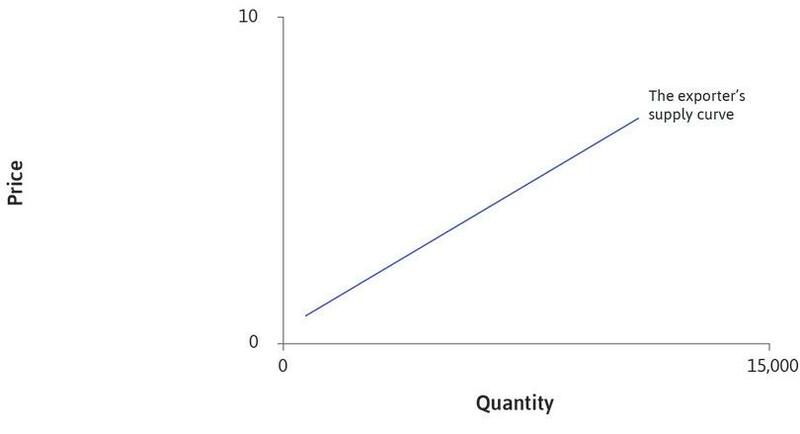 Figure 18.6 is a graph of an index that represents trade costs. A higher index represents higher trade costs and less globalization. Based on this information, which of the following statements are correct? The graph suggests a consistent decline in trade costs since 1870. Attempts by countries to address their unemployment problems after the 1929 Great Depression seem to have led to a decline in globalization. There does not seem to be any evidence of increased globalization after the Second World War. The graph suggests that commodity market integration over the past 150 years was one of interrupted integration. There is a period between the two World Wars when the trade costs seem to have increased. After 1929 countries sought to protect their economies by placing tariffs on imports. There is a downward trend in the impediments to trade index after the Second World War. We see an overall downward trend in trade costs, with the notable exception of the interwar period. As in commodity markets, in international capital markets there is a similar pattern of nineteenth century globalization, followed by a brief episode of interwar deglobalization, and late twentieth century reglobalization. If countries existed in isolation, they would have to finance their investment needs using their own savings. If this were the case, they could not spend more than they earned in a year, and all their income would have to be spent domestically. Domestic expenditure would have to equal domestic income. In reality, we see lending and borrowing across borders, between individuals, financial institutions, companies, and governments. To keep the language simple, let’s talk about countries lending to or borrowing from other countries, bearing in mind the fact that these countries are not actors themselves but are made up of many individuals, companies, and institutions. A country can spend more than it earns by borrowing from abroad. Similarly a country can decide not to use its savings to finance domestic investment, and instead lend it abroad and earn a return on these foreign loans. In this case, its savings will exceed domestic investment, or (equivalently) its income will be higher than its expenditure. Records all payment transactions between the home country and the rest of the world and is divided into two parts: the current account and the capital and financial account. If there is a current account surplus, this is a source of foreign exchange and it is either used to purchase foreign assets such as factories (FDI) or financial assets (recorded as a private net capital outflow) or it adds to the home country’s official foreign exchange reserves. As a consequence, the home country’s wealth rises. The opposite is the case for a current account deficit. We use the balance of payments accounts to track lending and borrowing abroad. We first need to explain how lending and borrowing abroad is related to international trade in goods and services. This is because imports represent payments from the domestic economy to the rest of the world, while exports represent payments from the rest of the world to the domestic economy. The balance of payments records the sources and uses of foreign exchange. If the records of transactions were complete, the balance would sum to zero because the source and use of each dollar crossing an international border could be accounted for (in reality, an entry called ‘errors and omissions’ is added to the balance of payments accounts to make it sum to zero). To see how the balance of payments accounts work, think first about an economy where the only international payments are due to trade. If the home country imports more than it exports, then its residents are making more international payments than they are receiving. For example, a country buying a higher value of imports from the US than it receives from selling its exports to the US needs to get hold of the US dollars—by borrowing from the US or the rest of the world—to cover the difference. Conversely, if the home country is exporting more than it is importing, then its nationals must be lending to their trading partners so they can pay for the exports. These loans are a use of foreign exchange for the home country, and a source of foreign exchange for its trade partners. Thus a trade deficit will imply that the country is borrowing, while a trade surplus implies it is lending (which is equivalent to saving, as we saw in Unit 10). There are other reasons that people in one country make payments to people in another. The most important is the purchase of assets in another country. If a US company purchases shares in a company in China, it is making a payment for a Chinese asset. This implies a payment from the US to China. This is a use of foreign exchange called foreign portfolio investment. Similarly, if a US company purchases a factory in China, this is a use of foreign exchange called foreign direct investment (FDI). In subsequent years, however, the US company will receive dividends from its portfolio investment or profits from its direct investment, which will be sent back (‘repatriated’) to the US company. These repatriated profits are payments from China to the US. They are recorded in the US balance of payments as a source of foreign exchange. Other important international payments include money sent home by migrant workers to their families (called remittances) and official aid flows, mostly from the governments of rich to poor countries. 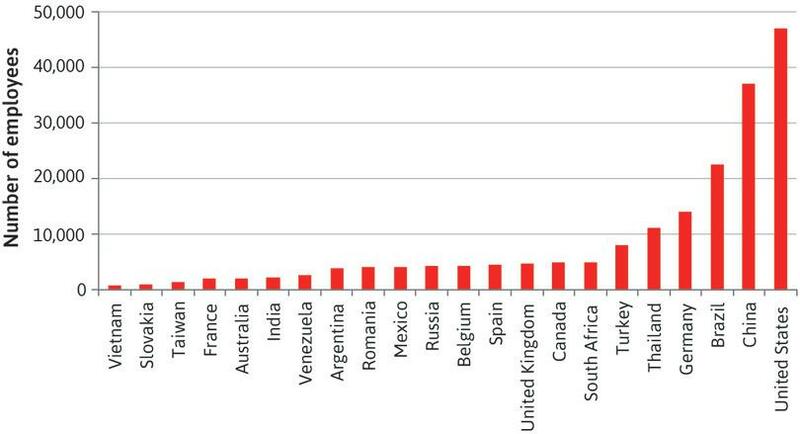 The sum of all payments made to a country minus all payments made by the country. CA deficit: This means the country is borrowing—it has to do so to cover the excess payments it is making to the rest of the world. CA surplus: This means the country is lending (saving) to allow other countries to send it the excess payments. All of these international payments are tracked in the balance of payments accounts, and the net value of these payments is called the current account (CA)—so the CA is the sum of all payments made to a country minus all payments made by the country. A country might have a trade deficit—that is, import more than it is exporting—but still have a current account surplus if it is receiving more than enough income from its foreign investments, remittances or foreign aid to pay the difference. In this case it will not need to borrow. For simplicity we ignore remittances and international aid and assume that the current account is equal to exports (X) minus imports (M) plus net earnings from assets owned abroad. The borrowing and lending tracked by the current account are known as net capital flows. In this context, capital refers to money that is being lent and borrowed, rather than capital goods. A country that is borrowing (has a CA deficit) is receiving net capital flows—it is borrowing cash in order to cover its CA deficit. This cash will have to be paid back in the future, so capital inflows also represent rising foreign debt for the country. If the borrowed money is used for productive investments though, the investment can help generate the income needed to repay the debt. Thus, when a country wants to invest more than it can afford using its own savings, borrowing from abroad can be used to finance the extra investment. Historically, increased trade tends to lead to larger CA imbalances. That is, when countries trade more, they also tend to borrow and lend more. The measure shown in Figure 18.8 is the sum of the absolute values of the current account balances of 15 countries from 1870 to 2014. We add up the absolute value of the current accounts to capture both borrowing and lending across countries. Figure 18.8 International capital flows (1870–2014). (1) Figure 2.2 from Maurice Obstfeld and Alan M. Taylor. 2005. Global Capital Markets: Integration, Crisis, and Growth (Japan–US Center UFJ Bank Monographs on International Financial Markets). Cambridge: Cambridge University Press; (2) International Monetary Fund. 2014. World Economic Outlook Database: October 2014. Note: The data shown in the figure is the average absolute current account balance (as a percentage of GDP) for 15 countries in five-year blocks (from 1870–74 through to 2010–14). The countries in the sample are Argentina, Australia, Canada, Denmark, Finland, France, Germany, Italy, Japan, Netherlands, Norway, Spain, Sweden, UK, US. Data for 2014 is an IMF estimate. As with commodity trade (Figure 18.6), the volume of capital flows in Figure 18.8 reflects a pattern of interrupted globalization. During the late nineteenth century there were huge capital flows from northwest Europe where there were current account surpluses—the UK especially, but also France and Germany—which financed investment in railways and infrastructure in countries such as Argentina, Australia, Canada, and the US. These were all countries with abundant and underexploited natural resources, especially land, but railways had to be extended into the interior in order to exploit these resources, and the land had to be settled with immigrants. In Europe, the countries that succeeded in attracting foreign investment during this period, such as Russia and Sweden, were also relatively resource-abundant. The investments made a healthy return, since they increased the productive capacity of the borrowing countries, who were able to pay back the loans with interest based on the increased incomes that they enjoyed as a result. 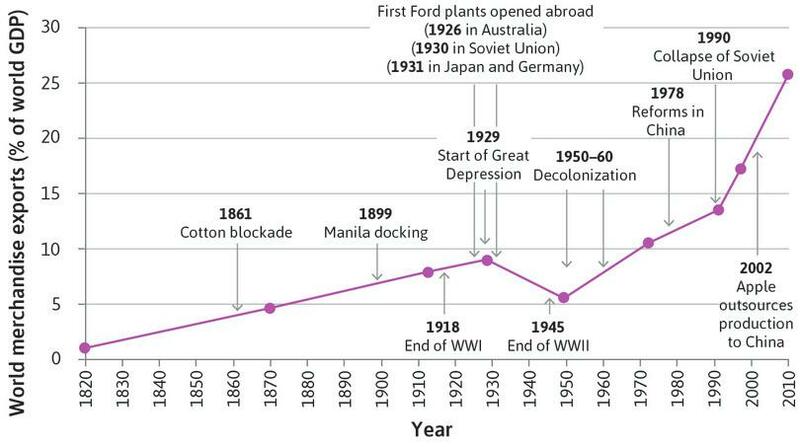 In the interwar period these capital flows fell sharply—especially after the beginning of the Great Depression in 1929, which had led many countries to impose strict limits on the movement of capital across frontiers. These limits on capital flows meant that countries had to keep their current account deficits and surpluses relatively low— they prevented the capital inflows that would be required to finance large current account deficits. Unlike international trade, which resumed growth soon after the end of the Second World War, capital controls persisted for longer and only started to be relaxed in the 1970s and 1980s. Since then capital flows have increased sharply, although not yet to their dizzying heights of the early twentieth century. Figure 18.9 shows how international asset holdings evolved during the twentieth century. The pattern is U-shaped. For the rich countries that dominated international lending, the share of foreign assets divided by GDP was high in the early part of the century, but collapsed in the 1930s. After 1945, New York took over from London as the global financial centre and the US eclipsed Britain as the dominant international asset holder. Figure 18.9 International asset holdings (1900–2014). (1) Figure 2.2 from Maurice Obstfeld and Alan M. Taylor. 2005. Global Capital Markets: Integration, Crisis, and Growth (Japan-US Center UFJ Bank Monographs on International Financial Markets). Cambridge: Cambridge University Press; (2) Lane, Philip R., and Gian-Maria Milesi-Ferretti. 2007.‘Europe and Global Imbalances’. IMF Working Papers 07 (144). The series shows the ratio of international assets to the GDP of the sample of countries in each year. To measure price gaps in international capital markets, we need prices of identical financial assets in different countries. 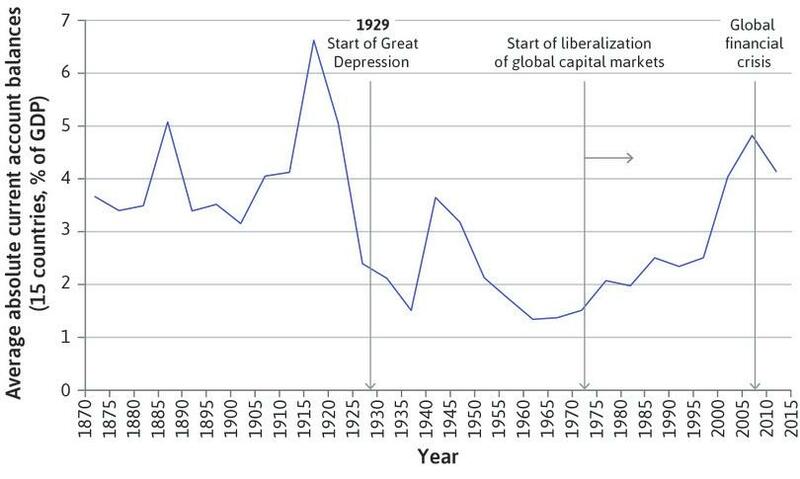 Where researchers have been able to locate such prices, they have found that the late nineteenth century saw significant globalization in capital flows. For most of the nineteenth century, if a would-be arbitrageur in New York (or London) wished to act on a price gap between New York and London, the speed at which information travelled limited his opportunities (we tracked the speed at which information travelled over the past 1,000 years in Unit 1). Information about price gaps travelled on ships that crossed the Atlantic. By the time the arbitrageur learned of the price gap, the information was already several days out of date. To act on it, he had to send written instructions to his agent in the other city to buy or sell. These instructions travelled by ship too. It took a large price gap, therefore, to create speculation, since prices may have changed by the time the orders made it across the Atlantic. In 1866, investors in London and New York (and their agents) could, for the first time, communicate with each other on the same day. They were using the first transatlantic telegraph cable, running from Ireland to Newfoundland in Canada. Once the cable was installed, investors could act immediately when they heard of a potential arbitrage opportunity, and price gaps immediately collapsed. In most countries, residents and companies do the majority of investment. One dimension of globalization is the foreign direct investment (FDI) mentioned earlier by companies abroad, including subsidiaries. Unlike the use of savings to buy foreign bonds or shares in a foreign company (portfolio investment), the intention of FDI is to exercise control over the use of resources in the foreign company. Figure 18.10 shows the destination of investments by US companies when they invested directly in other companies abroad between 2001 and 2012. Perhaps surprisingly, when US firms chose to produce outside the US, they mostly went to countries in Europe; and in Europe, largely to countries in which wages were higher than in the US. The Netherlands, Germany, and the UK alone received more US investment than Asia and Africa combined. In this respect the location of Ford plants around the world shown in Figure 18.1 is not typical, because Ford has far more employees in China, Brazil, Thailand, and South Africa combined than in Germany, UK, Canada, Belgium, and France combined. Foreign direct investment: Investment by US firms in other countries according to whether wages are lower or higher than in the US (2001–2012). Figure 18.10 Foreign direct investment: Investment by US firms in other countries according to whether wages are lower or higher than in the US (2001–2012). Exercise 18.3 International capital flows: Does capital flow from richer to poorer countries? China has enjoyed a period of rapid development over recent decades. Using data from FRED, plot China’s current account balance over the period 1998–2012, and describe how it has evolved since the late 1990s (Hint: search for ‘total current account balance for China’). Make sure to highlight whether it is a CA surplus or deficit. On the same graph, plot the current account balance of the US over the same time period, and compare it with China’s current account balance (you can also find the data for the US at FRED by searching for ‘total current account balance for United States’). What does your graph suggest about capital flows between richer and poorer countries? Read the 2007 article ‘The paradox of capital’ by Eswar Prasad, Raghuram Rajan and Arvind Subramanian, who are IMF economists. Explain what is meant by ‘capital flowing uphill’ and whether or not it is a paradox. Look at Figure 18.8 and note that international capital flows (as measured by average absolute current account balances as a proportion of GDP) in the first decades of the twenty-first century are similar to those of the late nineteenth century. Using the discussion of capital flows in this section and in the article from question 3, was capital ‘flowing uphill’ during Globalization I or Globalization II? Why, or why not? Which of the following statements regarding current accounts is correct, ceteris paribus? An increase in the trade surplus would lead to a decrease in a country’s current account. A country with zero trade balance but historically high foreign direct investment would always have a current account deficit. An increase in remittances by a country’s nationals abroad would lead to a lower current account. An increase in the official aid payment sent to other countries means a lower current account. An increase in the trade surplus means a larger export–import gap. The country would then be receiving more international payments, resulting in an increase in its current account. A country with historically high FDI may have high dividend receipts from these investments. Given a zero trade balance, when the net investment earnings are positive the current account would be in surplus. Remittance is where migrant nationals send money back to their families at home. This would increase the home country’s current account. Aid money sent abroad directly reduces a country’s current account. In the longer run however, it may help stimulate new export markets. In the late nineteenth century, declining transport costs and rising wages made passage to America affordable for millions. Since then, labour migration is probably the dimension of globalization along which international economic integration has advanced the least. Indeed, labour into and out of some countries is less mobile internationally today than it was in 1913. Figure 18.11 plots immigration into the US as a percentage of the increase in the US population. During the late nineteenth and early twentieth century immigrants accounted for more than half of the increase in the US population, their numbers more than equalling the number of births minus the number of deaths. Restrictive legislation curbed immigration between the world wars. Although the contribution of immigrants to the growth in population has been rising again since the Second World War, it has not matched the growth before 1914. The low figures from the mid-1940s to the 1970s can in part also be explained by the relatively high birth rate in the US over this period. Immigration into the US as a percentage of the change in US population (1820–1998). Figure 18.11 Immigration into the US as a percentage of the change in US population (1820–1998). Susan B. Carter, Michael R. Haines, Richard Sutch, and Scott Sigmund Gartner (editors). 2006. Historical Statistics of the United States: Earliest Times to the Present. New York: Cambridge University Press. There were relatively few institutional barriers to immigration in the late nineteenth century. Today, migrants without appropriate docu­mentation may be deported or imprisoned. This meant that when Europe was experiencing its population boom, as death rates fell sharply and birth rates fell only with a lag, it was able to ship its surplus population to what the fifteenth-century explorer Amerigo Vespucci had named the ‘New World’ in America. 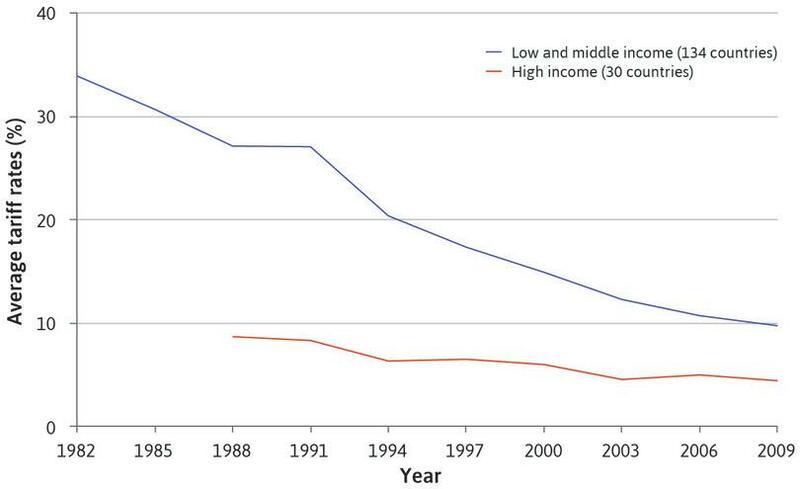 Today’s lower-income countries are not so fortunate. Immigration barriers were already in place during the late nineteenth century, but they became much stricter during and after the First World War, and rich countries retain strict immigration barriers to this day. Thus the movement of goods and finance between countries is easier, and greater in magnitude, than the movement of people. Sending your money or your goods to some distant economy is much easier than sending yourself. You might have to learn an entirely new language or culture, not to mention leaving behind family and your home community. This is one reason why, for labour, there is nothing equivalent to the reduction in price gaps for goods that we discussed above. There is no tendency of wages in different countries around the world to become more similar. Figure 18.12 shows the trends in wages paid to manufacturing workers expressed as a ratio of the wages of US manufacturing workers. It indicates, for example, that in the late 1970s, workers in Finland were paid 80% of the wage of US workers but, by 2012, they were paid more than 20% more. Manufacturing wages relative to the US (1975–79 and 2012). Figure 18.12 Manufacturing wages relative to the US (1975–79 and 2012). US Bureau of Labor Statistics. 2015. International Labor Comparisons. Note: (1) Data is for hourly compensation costs in manufacturing, which includes total hourly direct pay (pre-tax), employer social insurance expenditures, and labour-related taxes. National currency data converted into US dollars at the average daily exchange rate for the reference year; (2) Graph of Sri Lanka shows most recent available data, for the year 2008. 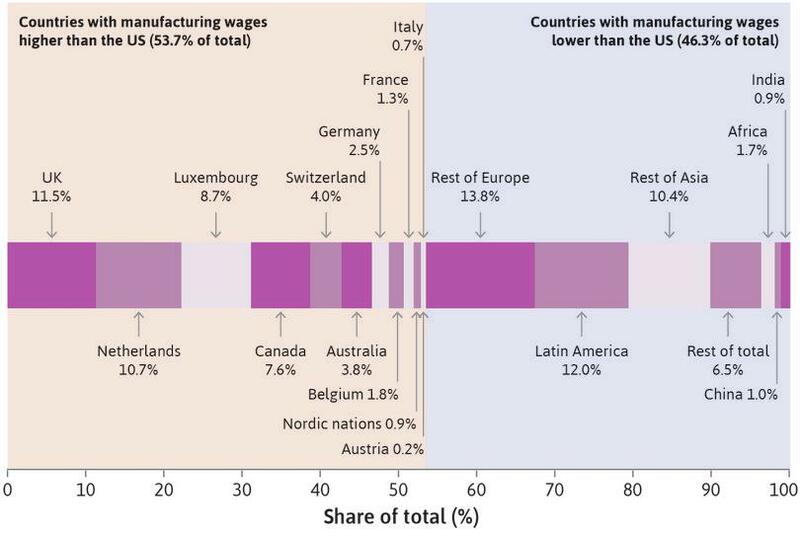 Like France, many other European countries caught up with the US in manufacturing wages, in some cases surpassing them by more than 40% (Norway and Sweden). Wages in South Korea and Japan rapidly converged towards the US wage level. A number of low-wage countries (for example, Sri Lanka) remained far behind, some falling even further behind (Mexico). In conclusion, there was a dramatic increase in the integration of the world economy during the nineteenth century, which was marked by increasing volumes of trade and corresponding reduction in price gaps, as well as the movement of capital. This was followed by a brief period of deglobalization during the Great Depression and the Second World War, and renewed globalization afterwards, especially since the 1990s. These three waves of globalization, deglobalization, and reglobalization are equivalent to those in Figure 18.4. Trade costs and barriers to the mobility of capital and labour fell in the nineteenth century, largely as a result of steam-driven transportation technologies. They rose again in the interwar period, largely due to government intervention—taxes and other barriers to trade, capital controls and immigration restrictions—and fell again in the late twentieth century, as a result of more liberal policies and technological change. National boundaries, however, have continued to be important barriers to the global integration of labour markets. Figure 18.11 depicts the level of immigration into the US as a percentage of the change in the US population. In the decade prior to the First World War, the number of immigrants was higher than the number of births minus the number of deaths. Wars cause permanent declines in the level of migration. As with trade in goods and capital flows, there is evidence of a continued trend of ‘reglobalization’ in migration since the end of the Second World War. 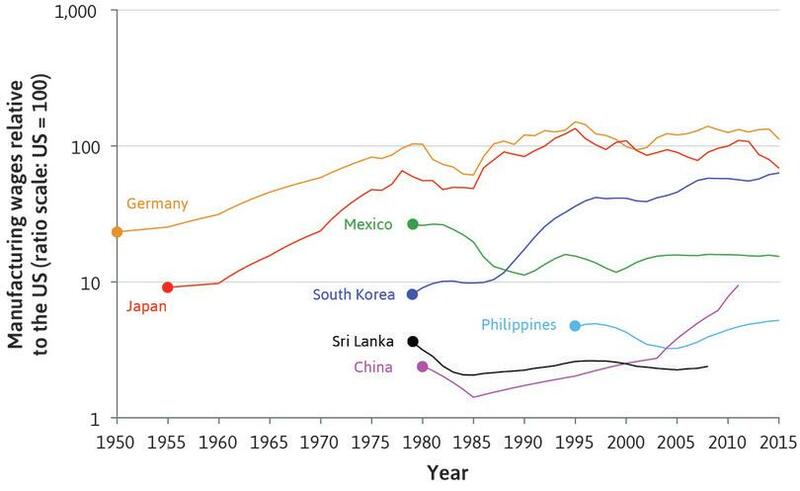 The trend in the graph suggests that with high migration over the past 150 years the wages in different countries around the world should now be similar. Since immigration accounted for over half the increase in US population, the number of new immigrants must have exceeded the difference between births and deaths. There was a sharp rise in the immigration level for a short period after the First World War. Even if this were not the case, remember that we must be cautious before inferring causality from a time series graph such as this—many other factors influence the level of migration. Since the restrictive immigration law in 1923, the level of immigration has not recovered to the levels seen before it, suggesting that national boundaries continue to be barriers to the global integration of labour markets. With restricted migration, this is not true. Whilst wages in the manufacturing sector in many European countries, as well as Japan, have converged (and in many cases overtaken) the level in the US since 1975, wages in Mexico have actually fallen relative to the US. Specialization: Particular locations specialize in the production of distinct goods. International trade: These goods are then exchanged with other locations specializing in other goods. Specialization entails trade because by producing a narrower range of goods and services than you use, you must engage in trade to acquire the ones you do not produce. International trade is the outcome of specialization among countries. Machine tools (such as precision-cutting tools) produced in southern Germany are used in the production of computers in coastal south China running software produced in Bangalore and California. These are then flown on aircraft produced near Seattle in the US to be sold to users throughout the world. Producers of these commodities put food on their table grown in the Canada or Ukraine and wear shirts made in Mauritius. As these examples show, trade and specialization are two sides of the same process. Each provides the conditions necessary for the other. In the absence of trade, machine tool workers in Stuttgart could not eat bread made from grain grown in Ukraine or Canada and wear clothes made in Mauritius. If they had to provide for themselves, many of them would be farmers or clothing workers. In the absence of specialization, there would be little to trade. In Section 1.8, you met Greta and Carlos, who each wanted to consume both apples and wheat. With their own land and labour they each could have produced both crops, and been entirely self-sufficient. But they found that they could be better off by specializing; Carlos producing only apples and Greta producing only wheat. The two were better off by specializing because their land differed in what it was best at producing. While Carlos could produce 50 times as many apples as tonnes of wheat on his land if he produced just one crop, Greta could only produce 25 times as many apples as tonnes of wheat (again, if she produced just one or the other). Although Greta could produce more of either crop than could Carlos, Carlos had a comparative advantage in producing apples (in terms of productivity, he was less inferior to her in producing that crop compared to the other). Make sure you understand the term comparative advantage and Figures 1.9a and b before going on. We are going to use the same reasoning to explain why entire countries specialize in some goods and services, and some in others. For Greta and Carlos, the reason for specialization was that they had different land. In the same way, the natural resources and climate of countries differ. It would be very costly to produce bananas in Germany given the climate, and this is one of the reasons why Germans make their living doing other things. But there are many other reasons for specialization. Suppose instead that Greta and Carlos had identical plots of land and the same set of skills. They are equally adept at growing either wheat or apples, but the production of both apples and wheat is subject to economies of scale. This would mean, for example, that doubling the amount of land and their own time devoted to the production of, say, apples would more than double the quantity of apples produced. Whether or not this is a reasonable assumption depends on the production technology of each good. So we will replace Figure 1.9a, which showed the case of specialization based on factor endowments, with Figure 18.13. In the table in this figure, you see that if 25 hectares (and a proportional amount of either Greta’s or Carlos’ labour is devoted to the production of apples), 625 apples will be produced. If the land devoted to apple production is doubled to 50 (with half of labour time still applied to its production) apple production increases by a factor of four, to 2,500. Economies of scale in the production of wheat and apples. Note that the entries in the ‘Apples’ row are just the square of the amount of land devoted to the production of apples, and the ‘Wheat’ row is just one-tenth of the number of apples produced in each column. Figure 18.13 Economies of scale in the production of wheat and apples. Note that the entries in the ‘Apples’ row are just the square of the amount of land devoted to the production of apples, and the ‘Wheat’ row is just one-tenth of the number of apples produced in each column. Imagine the two working as self-sufficient farmers, each with 100 hectares, dividing their land and labour equally between the two crops. They would each have 250 tonnes of wheat and 2,500 apples to consume. But if either one of them were to specialize in wheat and the other in apples and then share the resulting crops equally, they could have four times as much wheat and apples as they would have in the absence of specialization. The important point here is that it doesn’t matter who specializes in what. The advantage of specialization does not come from any difference between the endowments (skills, land) of Greta and Carlos but instead from the fact that people each producing a lot of one thing may be more efficient than them producing lesser amounts of many things. Economies of scale, agglomeration, and other positive feedbacks: The production of aircraft is subject to extraordinary economies of scale. The Boeing Plant in Everett, Washington is the largest building in the world (over 13 million cubic metres in volume). Writing computer code is not subject to economies of scale, but good software is produced in areas in which a very large number of people are working on similar tasks, sharing information and innovating. Differences between regions: Alberta has an appropriate climate and soil for growing grain. The production of clothing requires a lot of labour but not an extensive amount of capital goods, fitting the availability of these factors of production in Mauritius. German apprenticeship training schemes support the high level of skills needed for the machine tool industry. The distinctive aspect of the first source of specialization is its accidental quality. Why Everett, Washington rather than Osaka, Japan? Why is Bangalore a software hub, and not Singapore or Sydney? The cost reductions that firms may enjoy when they are located close to other firms in the same or related industries. Don’t confuse this with economies of scale or economies of scope, which apply to a single firm as it grows. To explain specialization we often need to draw on both types of ex­planation. German machine tool production, for example, benefits not only from the high level of skill of the German workforce but also from economies of co-location, called economies of agglomeration. Firms also share information and develop common industry standards for components, and they stimulate research in the region, from which they benefit. Figure 18.14 summarizes our explanation of specialization and trade. Between-country cost differences, specialization, and trade. 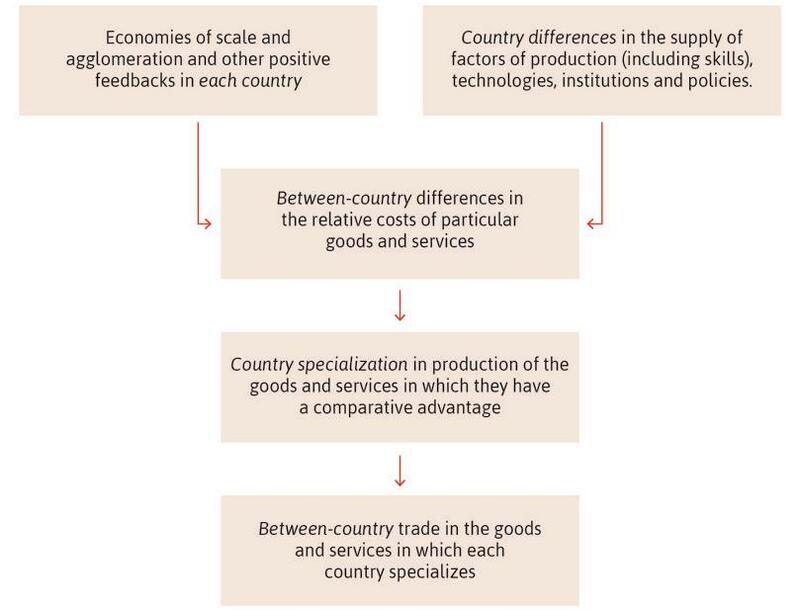 Figure 18.14 Between-country cost differences, specialization, and trade. Choose a few goods and services not discussed in this unit (for example, wine, automobiles, professional services such as accounting and auditing, consumer electronics, bicycles, or fashion goods). Use Figure 18.14, along with what you know or can research about your chosen products, to provide an explanation of country specialization patterns. In this section, we look in more detail at trade specialization based on factor endowments, extending the analysis in Section 1.8. We show how trade between the people of different nations—specialized in the production of different things—can result in mutual gains, and also in conflicts over how these gains are distributed. Imagine Greta lives on Wheat Island and Carlos lives on Apple Island. The land on each island can be used for growing both wheat and apples, and they consume both wheat and apples in order to survive. For the example in this section, we will use the numbers shown in Figure 18.15, and assume that Greta and Carlos each have 100 hectares of land. We have already seen that Greta is lucky. Wheat Island has better soil for both crops. She has an absolute advantage in both crops. Although Carlos’ land is worse overall for producing both crops, his disadvantage is less, relative to Greta, in apples than in wheat. Absolute and comparative advantage in the production of apples and wheat. Figure 18.15 Absolute and comparative advantage in the production of apples and wheat. Remember, even those who have an absolute advantage in nothing at all will specialize in the thing at which they are least bad, and get the other goods they consume by exchange. Similarly, people who are better at producing everything will specialize in the goods at which they are comparatively best, while importing other goods. Both Greta and Carlos can benefit from specialization and trade. To see how this works, follow the analysis in Figure 18.16a. Carlos’ (Apple Island’s) and Greta’s (Wheat Island’s) feasible production frontiers. Figure 18.16a Carlos’ (Apple Island’s) and Greta’s (Wheat Island’s) feasible production frontiers. The left-hand panel of the figure shows the combinations of wheat and apples that Carlos can produce in a year. If he produces only apples and has 100 hectares of land, he can produce 10,000 of them. This is shown by point A on the horizontal axis. Figure 18.16a-a The left-hand panel of the figure shows the combinations of wheat and apples that Carlos can produce in a year. If he produces only apples and has 100 hectares of land, he can produce 10,000 of them. This is shown by point A on the horizontal axis. Similarly, if Carlos produces only wheat then he can produce 4,000 tonnes, as shown by point B on the vertical axis. Figure 18.16a-b Similarly, if Carlos produces only wheat then he can produce 4,000 tonnes, as shown by point B on the vertical axis. The red line that joins points A and B is the feasible production frontier for Carlos. It shows all the combinations of wheat and apples that can be produced by Carlos in a year. Figure 18.16a-c The red line that joins points A and B is the feasible production frontier for Carlos. It shows all the combinations of wheat and apples that can be produced by Carlos in a year. He can choose to produce any combination on (or inside) the frontier. For example, he could produce 2,000 tonnes of wheat and 5,000 apples, as shown by point C.
Figure 18.16a-d He can choose to produce any combination on (or inside) the frontier. For example, he could produce 2,000 tonnes of wheat and 5,000 apples, as shown by point C.
He can produce anywhere between the origin and the feasible production frontier. The red shaded area shows his feasible set. Figure 18.16a-e He can produce anywhere between the origin and the feasible production frontier. The red shaded area shows his feasible set. This is shown in the right hand panel. Greta can produce more of both goods than Carlos can. If she only produces a single good, she can produce either 12,500 apples or 10,000 tonnes of wheat with 100 hectares of land. Figure 18.16a-f This is shown in the right hand panel. Greta can produce more of both goods than Carlos can. If she only produces a single good, she can produce either 12,500 apples or 10,000 tonnes of wheat with 100 hectares of land. It has this advantage in producing both goods because Greta can produce more of both of them. Graphically, Greta’s feasible set includes Carlos’ within it. Figure 18.16a-g It has this advantage in producing both goods because Greta can produce more of both of them. Graphically, Greta’s feasible set includes Carlos’ within it. In the absence of trade, Carlos and Greta do best by selecting a point on the highest indifference curve possible, given the constraint of their feasible production frontier. In our simple example, the feasible production frontier is also the feasible consumption frontier, because each person spends time producing only wheat and apples, and can consume only the amount they produce. Follow the analysis in Figure 18.16b to how Carlos and Greta make their production and consumption decisions. Carlos’ (Apple Island’s) and Greta’s (Wheat Island’s) utility-maximizing choices of consumption. Figure 18.16b Carlos’ (Apple Island’s) and Greta’s (Wheat Island’s) utility-maximizing choices of consumption. This is in the left-hand panel, coinciding with his feasible production frontier. Figure 18.16b-a This is in the left-hand panel, coinciding with his feasible production frontier. The shape of the indifference curves represents Carlos’ preferences over wheat and apples. 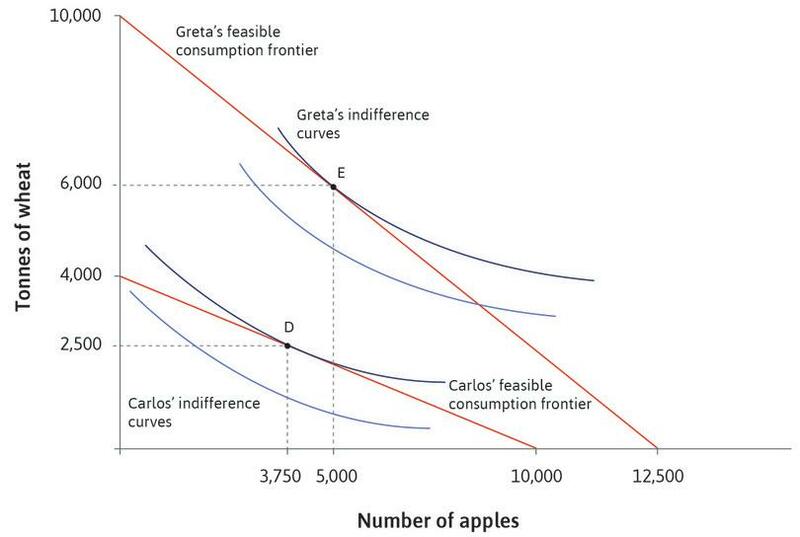 Figure 18.16b-b The shape of the indifference curves represents Carlos’ preferences over wheat and apples. It will be the one that is tangent to his feasible consumption frontier. He will choose to consume 2,500 tonnes of wheat a year and 3,750 apples, as shown by point D.
Figure 18.16b-c It will be the one that is tangent to his feasible consumption frontier. He will choose to consume 2,500 tonnes of wheat a year and 3,750 apples, as shown by point D.
This means she can consume more of both goods than Carlos. We assume her preferences are the same as Carlos’ (the indifference curves are the same shape). She consumes 6,000 tonnes of wheat a year and 5,000 apples, as shown by point E.
Figure 18.16b-d This means she can consume more of both goods than Carlos. We assume her preferences are the same as Carlos’ (the indifference curves are the same shape). She consumes 6,000 tonnes of wheat a year and 5,000 apples, as shown by point E.
What will happen when Greta and Carlos are able to trade? The decision to trade could be made for a number of reasons, such as the development of a new technology (maybe a boat) or the removal of barriers to trade (perhaps the end of a feud between the two islands). As we learned in Unit 1, it is the relative, not the absolute, cost of producing the two goods that matters for mutually beneficial trade. We will show that both Carlos and Greta gain when one island specializes in the production of wheat and the other specializes in the production of apples. Carlos can produce 4,000 tonnes of wheat a year, or 10,000 apples. In order to produce one more tonne of wheat, Carlos has to produce 2.5 fewer apples, so the marginal rate of transformation between tonnes of wheat and apples is 2.5. Since it takes the same amount of inputs (land and labour) to produce one tonne of wheat as it does to produce 2.5 apples, a tonne of wheat will cost the same as 2.5 apples. Thus the relative price of wheat to apples will be 2.5. The relative price is another way of referring to the marginal rate of transformation or the opportunity cost. Greta is more productive in producing both goods. Greta can produce 10,000 tonnes of wheat in a year, or 12,500 apples. The relative price of wheat to apples on Wheat Island is therefore 1.25. Wheat Island therefore has a comparative advantage in producing wheat. The relative price of apples is simply the inverse of the relative price of wheat, so if Wheat Island has a comparative advantage in producing wheat, then Apple Island will have a comparative advantage in producing apples. Figure 18.17 summarizes the key numbers from the example. The relative prices of the good for which each island has a comparative advantage are shown in bold. An island has a comparative advantage in producing a good when it is relatively cheaper in their economy (in the absence of trade). 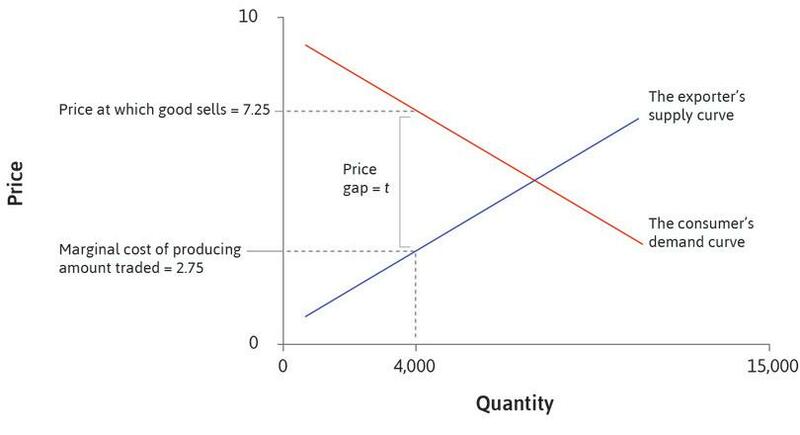 Figure 18.17 An island has a comparative advantage in producing a good when it is relatively cheaper in their economy (in the absence of trade). When there is no trade (autarky, closed economies), the feasible production frontier is also the feasible consumption frontier. From Figure 18.16b, we can see that when the economies are closed, total production between the two countries is 2,500 + 6,000 = 8,500 tonnes of wheat and 3,750 + 5,000 = 8,750 apples. When countries fully specialize however, Greta is able to produce 10,000 tonnes of wheat and Carlos can produce 10,000 apples, so there is more of both goods overall. As long as they can trade, they can both consume more of each good and can, ideally, both be better off. If we assume that there are no trade costs, it is obvious that the relative price of wheat and apples is the same in each country when they trade. What will the new price be? From Carlos’ point of view, the supply of wheat has increased more than the supply of apples, so the price of wheat relative to apples will go down to something less than 2.5. Equally, from Greta’s point of view the supply of wheat has increased by less than the supply of apples, so the relative price of wheat will go up for her to something higher than 1.25. When trading, the prices will lie between the prices experienced by the two economies when they are closed. To see what happens when they trade, work through the analysis in Figure 18.18. The effect of trade and specialization on Carlos’ and Greta’s feasible consumption frontiers. Figure 18.18 The effect of trade and specialization on Carlos’ and Greta’s feasible consumption frontiers. The figure shows the feasible production frontiers for Carlos and Greta. Figure 18.18a The figure shows the feasible production frontiers for Carlos and Greta. The dotted red lines show the outward shift of the feasible consumption frontiers due to specialization and trade. We assume that the relative price of wheat after specialization and trade is 2 (an arbitrary price in between 1.25 and 2.5). 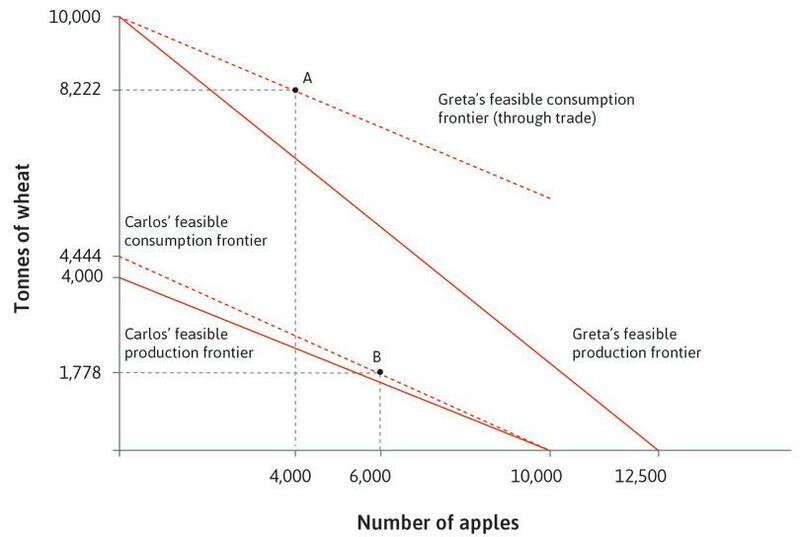 Figure 18.18b The dotted red lines show the outward shift of the feasible consumption frontiers due to specialization and trade. We assume that the relative price of wheat after specialization and trade is 2 (an arbitrary price in between 1.25 and 2.5). Carlos specializes in apples, producing 10,000, and exports (10,000 – 6,000 = 4,000) apples to Greta, who specializes in wheat, producing 10,000 tonnes and exports (10,000 – 8,000 = 2,000) tonnes of wheat to Carlos. Figure 18.18c Carlos specializes in apples, producing 10,000, and exports (10,000 – 6,000 = 4,000) apples to Greta, who specializes in wheat, producing 10,000 tonnes and exports (10,000 – 8,000 = 2,000) tonnes of wheat to Carlos. Because both countries are now specializing in the good in which they have a comparative advantage, the new consumption frontiers are above their production frontiers. For each country, the two frontiers meet at the point at which they do not trade, which given full specialization, correspond to each axis. We can see that specialization and international trade have led to an increase in the size of the feasible consumption set for both countries. Note that through trade, Greta cannot consume more than the maximum amount of apples Carlos can produce (10,000), which is why her feasible consumption frontier does not extend beyond 10,000 apples. If we look back to Figure 18.16b we can see that any expansion of their feasible sets makes it possible for both Carlos and Greta to reach a higher level of utility (a higher indifference curve), so trade has been mutually beneficial. Specialization has enlarged the feasible consumption set of both in the same way that borrowing and investing increased the feasible consumption set of Marco in Unit 10. By investing, Marco specialized in having income in the future, which increased the total income he earned over all periods. Then, by borrowing, he imported some of his future income to the present so that he could consume in both periods. The relative price determines the extent to which trade increases the feasible set of each island. This, in turn, depends on how the price is determined. Suppose that Greta can unilaterally determine the price. To increase her gains from trade, Greta will choose a price that increases the amount of apples she receives for each tonne of wheat she sells to Carlos. Intuitively, Greta wants the good she produces to command a higher price. If we assume that she has chosen a price of wheat of 2.25, then how does this affect the expansion of the feasible sets? Follow the analysis in Figure 18.19 to find out. The effect of trade and specialization on the feasible consumption frontiers for Carlos and Greta, when Greta is able to dictate the price. 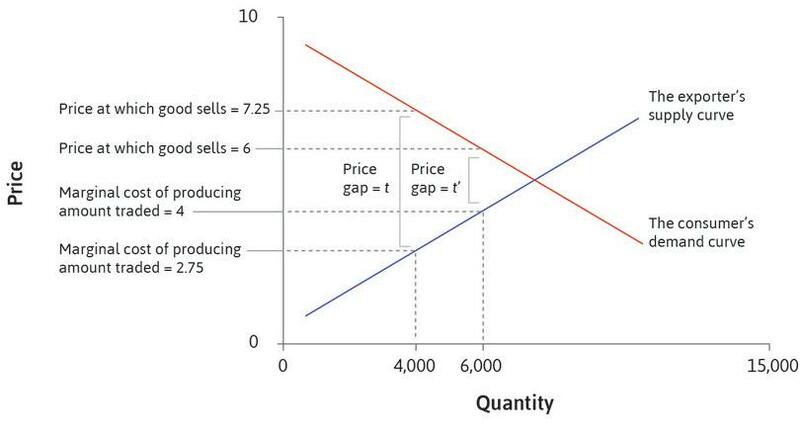 Figure 18.19 The effect of trade and specialization on the feasible consumption frontiers for Carlos and Greta, when Greta is able to dictate the price. The figure starts with the same feasible production frontiers as Figure 18.18. Figure 18.19a The figure starts with the same feasible production frontiers as Figure 18.18. Greta now dictates the relative price of wheat to be 2.25. Trade still shifts out both feasible sets, but it shifts Greta’s by more. This means trade and specialization will increase the utility of both Carlos and Greta, but will increase Greta’s utility by more. Figure 18.19b Greta now dictates the relative price of wheat to be 2.25. Trade still shifts out both feasible sets, but it shifts Greta’s by more. This means trade and specialization will increase the utility of both Carlos and Greta, but will increase Greta’s utility by more. Greta has to give up fewer tonnes of wheat to get 4,000 apples. She is better off than she was at a price of 2 in Figure 18.18. In contrast, Carlos is worse off relative to the price of 2. He gets fewer tonnes of wheat in return for the same number of apples. Figure 18.19c Greta has to give up fewer tonnes of wheat to get 4,000 apples. She is better off than she was at a price of 2 in Figure 18.18. In contrast, Carlos is worse off relative to the price of 2. He gets fewer tonnes of wheat in return for the same number of apples. Of course, if Greta could set any price she wished, she could have set an even higher price. If she set the price at 2.5 apples per tonne, she would eliminate Carlos’ gains from trade entirely. At this price Carlos would be equally well off if he produced his own wheat and would have no reason to engage in trade with Greta. When the people of a country are better able to influence the price in their favour, we say they have bargaining power. 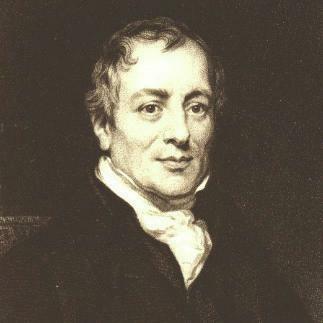 David Ricardo (1772–1823) developed the theory of comparative advantage. He was also the first economist to warn that a rapidly growing capitalist economy would confront the limits of its natural environment. Ricardo’s central contribution to economic theory was an analysis of the principles of production and distribution in a growing capitalist economy with a large agrarian sector. In An Essay on Profits, published in 1815, he developed the Ricardian model, which came to dominate British economic thought for much of the next 50 years. In this model, agricultural production relied on three inputs: labour, capital, and land. As production and population expanded, either existing land had to be farmed more intensively with greater doses of capital and labour, or less fertile plots had to be brought into production. Drawing on ideas of diminishing returns, he explained how this would lead to a squeeze on profits and the eventual stagnation of the economy. Like Thomas Malthus, whose ideas we studied in Unit 2, he reasoned that wages could not be below subsistence. As farming expanded to less good land, the price of food and hence wages would have to increase. A result would be that profits (which Ricardo presumed would be invested) would fall. Rents (presumed to be spent on luxuries) would increase due to the growing scarcity of land. The result would be the eventual slowdown and stagnation of the economy. His greatest work, On the Principles of Political Economy and Taxation (published in 1817), introduced the labour theory of value, later used by Karl Marx. This theory holds that the value of goods is proportional to the amount of labour required, directly or indirectly, in their production. Wassily Leontief (1906–1999) devised a way that these values could be calculated (see ‘When economists disagree: Heckscher–Ohlin, and the Leontief Paradox’ later in this unit). In Principles, Ricardo laid out the principle of comparative advantage, recognizing that two countries could trade to the mutual advantage of each, even if one of them was absolutely better at producing all goods. Ricardo is not as famous an economist as Smith, Malthus, Mill, or Marx, but he is greatly respected for the theory of comparative advantage. In addition, his method of structuring thought using an abstract model as a guide to economic understanding makes him a very modern great economist. Suppose that there are only two countries in the world, Germany and Turkey, each with four workers. Within a given time period, each worker in Germany can produce three cars or two televisions, and each worker in Turkey can produce two cars or three televisions. Draw the feasible production frontier for each country, with televisions on the horizontal axis and cars on the vertical axis. In the absence of trade, what is the relative price of cars in each country? Suppose that, in the absence of trade, Germany consumes nine cars and two televisions while Turkey consumes two cars and nine televisions. Mark these consumption points as G and T, respectively. Draw the feasible consumption frontier for each country in the absence of trade. Comment on the relationship between the production and consumption frontiers you have drawn for each country. Now suppose Germany and Turkey start trading. What is the range of possible values for the world relative price of cars? If the world relative price of cars is PC/PTV = 1, in which good will each country specialize? Now use the world relative price given above to draw the feasible consumption frontier of each country in the figures you have drawn. Use these figures to explain whether or not each country gains from trade. What is the marginal rate of transformation between cars and televisions in each country? Explain the relationship between comparative advantage and the marginal rate of transformation between goods. Going back to our example of Carlos and Greta, assume that Greta has the power to set the relative price. Based on what you have learned in Unit 4 about how people play the ultimatum game, how do you think Carlos would react to a price offer of 2.4 apples per tonne of wheat? 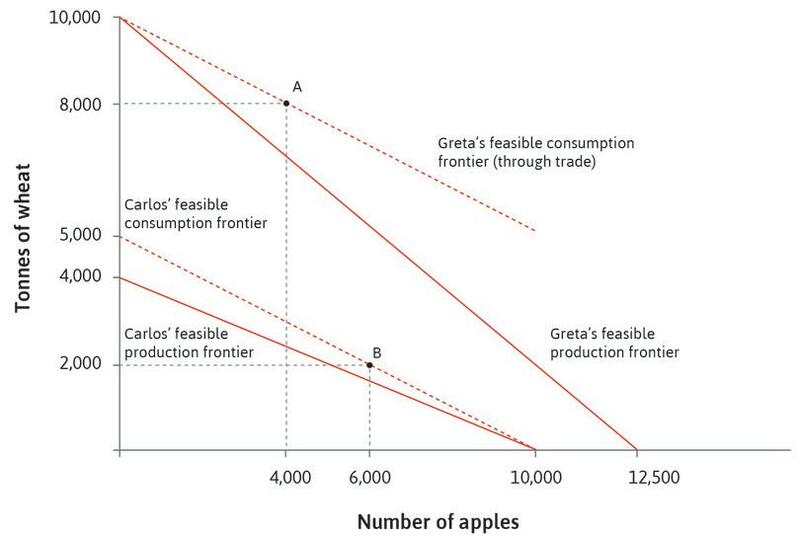 The following diagram shows Carlos’ and Greta’s feasible production frontiers and their utility-maximizing choices of consumption between wheat and apples under autarky (no trade). Carlos will choose to consume 10,000 apples. 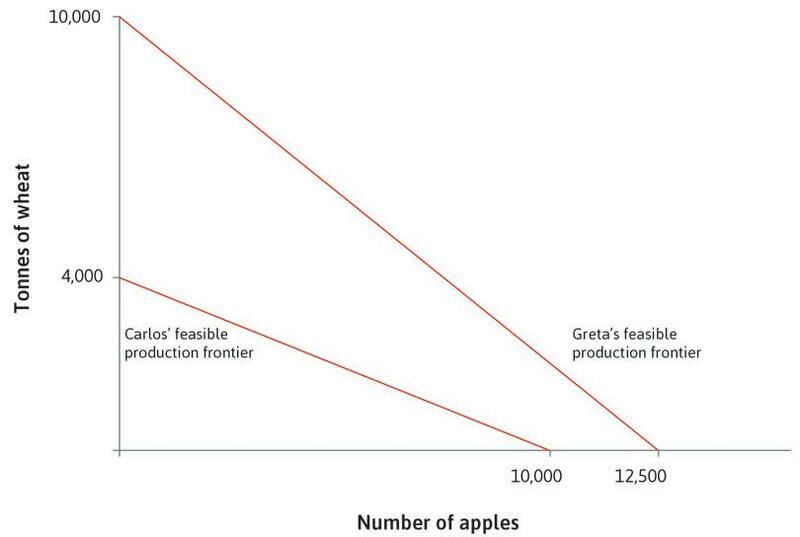 Greta can consume 3,750 apples and 2,500 tonnes of wheat but will choose not to do so. Greta has an absolute advantage in the production of wheat, while Carlos has an absolute advantage in the production of apples. Regardless of the shape of the indifference curves (which could be different from those depicted in the diagram), Greta will always choose to consume more of both goods than Carlos. Carlos will choose point D where he consumes 3,750 apples and 2,500 tonnes of wheat. This combination of goods lies within the feasible consumption frontier for Greta, but she is able to consume more of both good so would never choose this bundle. Greta has the absolute advantage in the production of both goods. It is entirely possible that with different shapes of indifference curves that Greta will choose to consume less of one of the goods than Carlos. For example, if her indifference curves were shallower (closer to being horizontal), she would consume fewer apples. Figure 18.18 depicts the feasible frontier and the consumption frontier of Carlos and Greta if they specialize and trade. The resulting relative price of wheat is assumed to be 2. Let the resulting consumption be at A and B, respectively, for Greta and Carlos. Then which of the following statements is correct? As Greta has the absolute advantage in production of both goods, she will produce both apples and wheat. Carlos produces 6,000 apples and 2,000 tonnes of wheat, while Greta produces 4,000 apples and 8,000 tonnes of wheat. Carlos trades 4,000 of his apples for 2,000 tonnes of Greta’s wheat. Greta is better off while Carlos is worse off as a result of the trade. The point is that they both specialize in the good with comparative advantage and trade. Therefore Carlos produces all the apples while Greta produces all the wheat. Those are their consumption choices as a result of trade. The two specialize and produce just one of the goods each. Given each person is fully specializing, to calculate the amount of each good that is traded we just need to look at their consumption of the goods that they do not produce themselves. These goods must have been traded. As a result of the trade they are both able to achieve a point on a higher indifference curve. Therefore they both benefit from the trade. The following diagram shows Alex’s and Jose’s feasible production frontiers for oranges and melons. Jose has an absolute advantage in the production of both melons and oranges. Jose has a comparative advantage in the production of melons. With trade and specialization, Jose will specialize in the production of oranges while Alex will specialize in the production of melons. The relative price of melons after trade will be 1.75. Jose’s feasible production set includes Alex’s within it, so he has absolute advantage in both goods. Jose can produce twice as many oranges as melons. On the other hand, Alex can produce 1.5 times as many oranges as melons. Therefore Jose has the comparative advantage in the production of oranges. 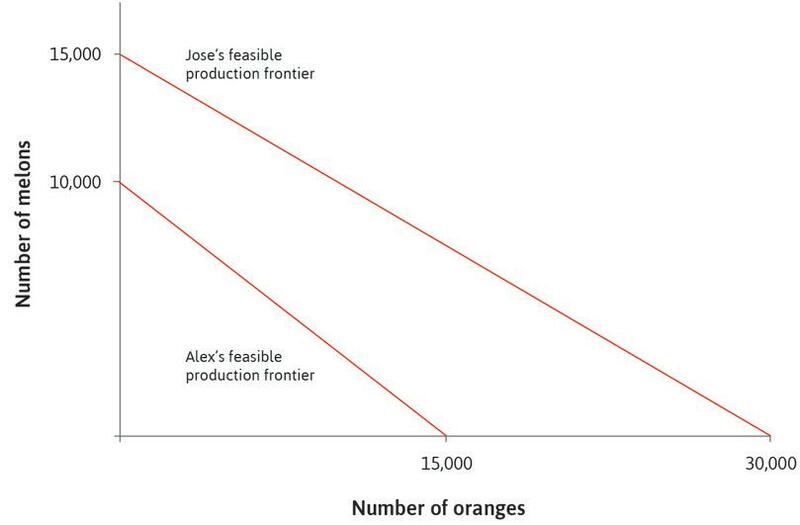 Visually comparing the slopes of the feasible production frontiers, we see that Jose has a comparative advantage in oranges and Alex in melons. The relative price after trade will depend on the bargaining power of the two, which may or may not be 1.75. Carlos and Greta both benefit from trade, so why are imports and exports often controversial? Unlike our story, in the real world there are almost always winners and losers. The processes of specialization and exchange affect regions, industries, and household types differently. Had the bakers and shoppers of Genoa known that cheap grain was aboard the Manila they would have cheered her into port, while local farmers may have secretly prayed for a shipwreck. Nations are composed of people with differing economic interests. They are not like our islands with only Greta and Carlos. Therefore, to understand these issues we need to go further than assuming a single individual or a set of identical individuals inhabits each nation. To think about winners and losers from trade, we begin with a model of two stylized countries, which we call the US and China, where specialization is based on factor endowments. The US is an advanced economy with a long tradition of manufacturing. China is less developed, but has become the world’s second-largest economy by exporting manufactured goods. Let us imagine, unrealistically, that the US and China produce only two goods, which are produced under constant returns to scale: passenger aircraft and consumer electronics (like games consoles, personal computers, and TVs). Furthermore, we assume (more realistically this time) that the US has an absolute advantage in producing both goods, and a comparative advantage in producing aircraft. We assume that aircraft production is capital-intensive and that capital is relatively abundant in the US. In contrast, China has a comparative advantage in consumer electronics production, which is more labour-intensive and China has an abundance of labour relative to capital. Given these assumptions, when the economies begin to trade with one another, the US will specialize in the production of aircraft, whereas China will specialize in the production of consumer electronics. It increases the consumption possibility set for both countries. Conflicts of interest emerge between the countries. Conflicts of interest emerge within each country. As we have seen, the relative price of the two goods affects how the gains from trade are divided between the countries. The usual forces of demand and supply affect the relative price, but the balance of bargaining power between the two affects the price too. For the US and China, and all other countries in the real world, relative prices are subject to the same forces. In Unit 15, for example, we investigated the macroeconomic consequences of oil price shocks. But what caused the increase in the relative price of oil? The first and second oil shocks (1970s): Relative price increases were due to political developments in the Middle East and to the ability of oil producers to exert monopoly power through a cartel. The exercise of monopoly power by producers shifted the supply curve upward. The third oil shock (2000s): The growth of China and other emerging economies caused a large increase in global demand. The global demand curve for oil shifted to the right. The beneficiaries of a rise in relative price are the inhabitants of the country that specializes in producing that product. But do all citizens benefit? Not everyone in a country is the same. For example, some people have only their labour to sell. Others have accumulated wealth, which they can use to invest in firms. In the example of the US and China, after trade the US specializes in producing aircraft and China specializes in consumer electronics. Trade and specialization mean that resources shift from one industry to another. Workers previously employed in electronics in the US must try to find work in the expanding aircraft manufacturing businesses. Similarly, in China, employment will expand in consumer electronics production. In the short run at least, those workers employed in the industry that their nation does not specialize in will lose out. For now, let us ignore any effect that trade has on the total size of the economy. We will return to this shortly. The increase in production of aircraft in the US increases the demand for the factor of production used intensively in that industry: capital. In China, it increases demand for labour instead. The winners in the US: The owners of capital benefit more from trade than workers, because capital becomes relatively scarce as production of aircraft rises. Since the wealthy tend to hold proportionally more of their wealth in capital than the poor, we would predict a rise in inequality. The winners in China: Workers are in higher demand as consumer electronics production expands. Wages rise as firms compete for workers. As we have seen in Unit 6, lower unemployment lowers the cost of job loss, and firms raise wages. Workers benefit more from trade than the owners of capital, hence we would expect inequality to fall. Trade and specialization in the US involves transferring labour and capital from electronics production to aircraft production. Think of what happens when one unit of capital, such as a factory, shifts from electronics to aircraft production. An electronics factory closes, laying off X workers, and an aircraft factory opens, hiring Y workers. Which is bigger, X or Y? The answer: X is bigger than Y, since one unit of capital provides the tools and equipment necessary to employ more workers in electronics than in aircraft production (since electronics is relatively labour-intensive). Thus, when capital shifts from electronics production to aircraft production, there is a net loss of jobs. This is of course also assuming that workers do not need to re-skill and, more generally, that there are no other frictions in the labour market. These factors would result in a greater loss of jobs in the short run. In this case, US workers are losing out, and US employers are winning. Workers are working for lower wages, and profits rise. The effect of imports of labour-intensive electronics and the shift in US production to less labour-demanding goods (aircraft) is that employers capture most of the gains from trade. As consumers of electronics, both employers and workers benefit. This is an example of a general principle about who benefits from international trade: The owners of relatively scarce factors of production in their own country prior to trade (US labour in our example) lose from specialization and trade, and the owners of relatively abundant factors (owners of capital in the US) gain. Factors that are relatively scarce in their own countries, compared with in the rest of the world, are relatively expensive compared to prices elsewhere when there is no trade. When their economies start trading with the rest of the world their price is dragged down towards the world average, because they are effectively competing with their abundant counterparts in the rest of the world. The same reasoning applies in reverse to factors that are relatively abundant in their own countries relative to the rest of the world. So, in the US in this example, workers are initially relatively scarce and lose from trade, while employers gain; in China workers are initially relatively abundant and gain from trade, while employers lose. The key to understanding this is to focus on the change in relative scarcity once labour and capital embodied in traded goods and services can flow across borders. This, however, ignores the overall increase in the size of the economy resulting from trade. This could benefit everyone in the economy and could therefore offset the losses experienced by the disadvantaged group (in this case, the US workers). Figure 18.20 illustrates the two dimensions of conflict arising from international trade. The winners and losers from trade between the US and China. Figure 18.20 The winners and losers from trade between the US and China. On the left we have the US and Chinese economies with limited specialization and trade. To make comparison easy, the economies are normalized to a size of one, and the numbers in the pies show both the proportion and size (in brackets) of the slice of the economic pie that accrue to workers (red) and the owners of capital (blue). On the right we show the US and Chinese economies with greater specialization and trade. The gains from specialization and trade are clear from the fact that the total size of each economy on the right is larger. The size of the US economy has increased by 30% and the size of the Chinese economy has increased by 40%. The prices at which they have traded (as determined by bargaining) have resulted, in this case, in China securing more of the gains from trade. But notice too that China’s shift into labour-intensive electronics has raised labour’s share of China’s larger pie, and reduced the share of profits. Both capital and labour in China are, however, better off with higher specialization and trade, as the absolute size of the slices going to workers and the owners of capital have both increased (0.5 < 0.84 and 0.5 < 0.56). The story is different in the US. The owners of capital goods (employers) now have a larger slice of the US’s larger pie, but the US workers’ slice is not only proportionally smaller (75% > 55%), but also smaller in absolute size (0.75 > 0.715). So even after we take the growth of the economy into account, US workers are the losers. US employers, Chinese employers, and Chinese workers are all winners. The same logic would continue to apply if we considered other factors of production. For example, consider two industries that require employees with different levels of skills and education: a skill-intensive industry (information technology) and a non skill-intensive industry (consumer electronics assembly). If a rich economy, relatively abundant in skilled labour, starts trading with a poor, unskilled, labour-abundant country, then unskilled workers in rich countries (and skilled workers in poor countries) will lose out relative to skilled workers in rich countries (and unskilled workers in poor countries), who will gain. You might think that this would affect the way that different groups viewed trade. Indeed, there is considerable survey evidence that unskilled workers in rich countries are more protectionist than skilled workers, but unskilled workers in poor countries are more in favour of trade than skilled workers. Of course, as illustrated in Figure 18.20, if the gains from trade are large enough it could still be the case that the members of the group that is relatively less well off within a country are made better off in absolute terms by the specialization and trade. The example of the US and China shown in this section does not only have relevance for the wave of globalization after 1945. One hundred years ago, when Eli Heckscher and Bertil Ohlin, two Swedish economists, were working on better understanding patterns of specialization and trade, they were motivated by the globalization of the late nineteenth century. One difference between then and now is the factors of production involved. While our example of the US and China focused on capital- and labour-intensive manufactured goods, the globalization of the late nineteenth century involved the exchange of land-intensive agricultural goods (food and raw materials such as cotton) for labour-intensive manufactures. The agricultural goods were exported by land-abundant (and labour-scarce) countries such as the US, Canada, Australia, Argentina, and Russia; the manufactured goods were exported by labour-abundant (and land-scarce) countries in northwest Europe, such as Britain, France, and Germany. In this context, the big losers were European landowners and workers in land-abundant regions; the big winners were European workers and the owners of land in the New World and other land-abundant economies. In Unit 2 we saw that workers in England gained economically, relative to landowners, from the middle of the nineteenth century onwards. The same happened in other land-scarce, labour-abundant societies in Europe and elsewhere (for example, Japan). Meanwhile, the ratio of land rents to wages rose strongly in land-abundant, labour-scarce regions: not just the New World economies mentioned earlier, but also in areas such as the Punjab, which was a major exporter of agricultural products. Not surprisingly, European landowners objected to this, and in countries such as France and Germany they succeeded in getting governments to impose tariffs on agricultural imports. There was thus a political backlash against globalization. Governments raised trade costs in the form of tariffs to counteract the impact of the fall in other trade costs, notably transportation. Suppose there are two countries that are identical in their factor endowments. Both would like to consume both passenger cars and commercial vehicles, industries in which there are economies of scale. In the absence of trade, each country would have both industries. If they could trade, both could benefit by specializing and taking advantage of economies of scale to lower their costs of production. Assume that once trade becomes possible, country A specializes in producing passenger cars and country B specializes in producing com­mercial vehicles. Because of economies of scale, the cost of passenger cars relative to commercial vehicles is lower in country A than in country B. Explain why we would expect to observe trade in similar products, known as intra-industry trade, when production technology is characterized by economies of scale. Who are the winners and losers in this example? How does your result compare with that of the winners and losers in the example of the US and China, where specialization is based on relative factor endowments? Figure 18.20 is a diagram that describes the effects of trade on the employers and the workers in the US and China. The initial size of each economy is normalized to one. The US has the comparative advantage in the capital-intensive goods, while China has the comparative advantage in the labour-intensive goods. As a result of trade the US’s economy is assumed to grow by 30% and that of China by 40%. Specialization means that China will produce all the capital-intensive goods. The US has the stronger bargaining power in the determination of the relative price after trade. In the US, the employers are better off while the workers are worse off as a result of trade. In China, the workers are better off while the employers are worse off as a result of trade. Specialization means that the US will produce all the capital-intensive goods, in which it has the comparative advantage. The fact that China’s economy grew by a larger percentage suggests that it has the stronger bargaining power. Employers in the US are better off since they now have a larger slice of a bigger pie (0.585 > 0.25). Even though the total size of the pie has increased, the share received by workers has fallen by such an amount that they are worse off (0.715 < 0.75). 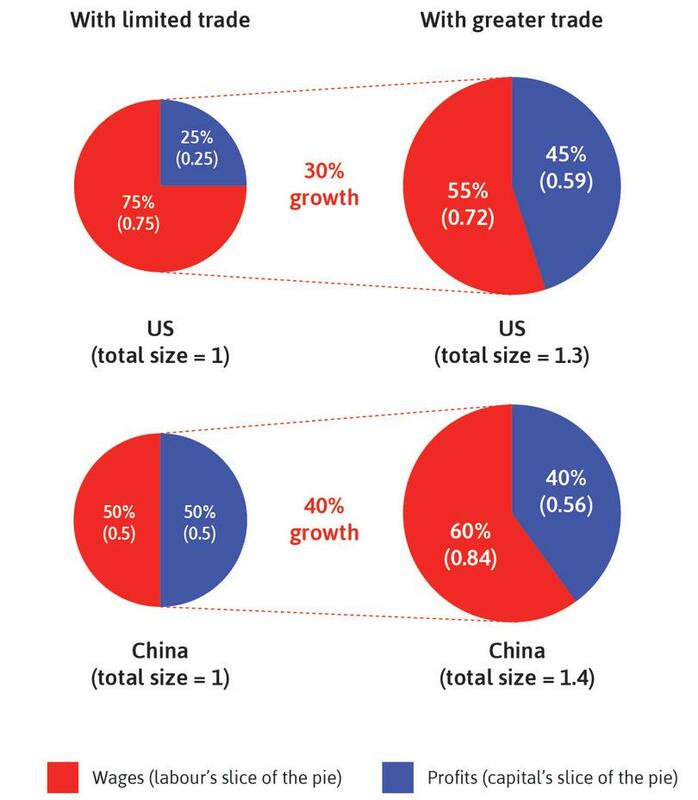 In China, while the share of the pie claimed by the capitalists is smaller after the trade, its absolute size is still increased. Therefore both the workers and the capitalists are better off. In the late 1980s and early 1990s, the Soviet Union collapsed. The Soviet Union comprised Russia and some of the countries that now make up eastern Europe and central Asia. It was a planned economy, run from Moscow by the Communist Party. Following this collapse, countries in the former Soviet Union and elsewhere in the former Soviet bloc—with a total of close to 300 million workers—opened their borders to international trade. What other information would you need to know about these countries to identify the actual winners and losers? In our example of the US and China, the short-run effect of trade was to raise the profits of US employers while depressing the wages of US workers. This would provide US employers with incentives to invest more in building additional capacity to produce aircraft. Our analysis of wages and employment in the long run (in Unit 16) provides a lens for us to study what will happen next. Specializing in the production of the good in which it has a comparative advantage increases the productivity of US labour (workers have moved from producing electronics to producing aircraft, where they are more productive). This shifts up the price-setting curve and output per worker. So, in this respect, specialization according to comparative advantage is similar to technological progress as analysed in Unit 16. It may be worth reviewing the key concepts in that unit before continuing on here. Use the analysis in Figure 18.21 to follow through the impact effect and adjustment process. We start with the US wage-setting curve and the price-setting curve before specialization and trade with China. The economy starts at point A with unemployment at the long-run rate of 6%. The long-run effect of specialization on unemployment in the US. Figure 18.21 The long-run effect of specialization on unemployment in the US. The economy starts at point A (U = 6%). Figure 18.21a The economy starts at point A (U = 6%). It has a comparative advantage. By specializing in the good it is relatively best at, this increases the average productivity of US labour, shifting up output per worker and therefore, the price-setting curve. Figure 18.21b It has a comparative advantage. By specializing in the good it is relatively best at, this increases the average productivity of US labour, shifting up output per worker and therefore, the price-setting curve. US consumers are now buying their DVD players from China. Some are hired in producing aircraft, but not all, because productive capacity in that sector is limited. The economy moves from point A to point B and unemployment rises. Figure 18.21c US consumers are now buying their DVD players from China. Some are hired in producing aircraft, but not all, because productive capacity in that sector is limited. The economy moves from point A to point B and unemployment rises. They expect this will continue in the future. They build new production capacity, expanding the demand for labour and re-employing the former electronics workers. The economy moves from point B to point C, and unemployment falls to 4% below its original level. Figure 18.21d They expect this will continue in the future. They build new production capacity, expanding the demand for labour and re-employing the former electronics workers. The economy moves from point B to point C, and unemployment falls to 4% below its original level. The demand increases workers’ bargaining power. Wages increase. 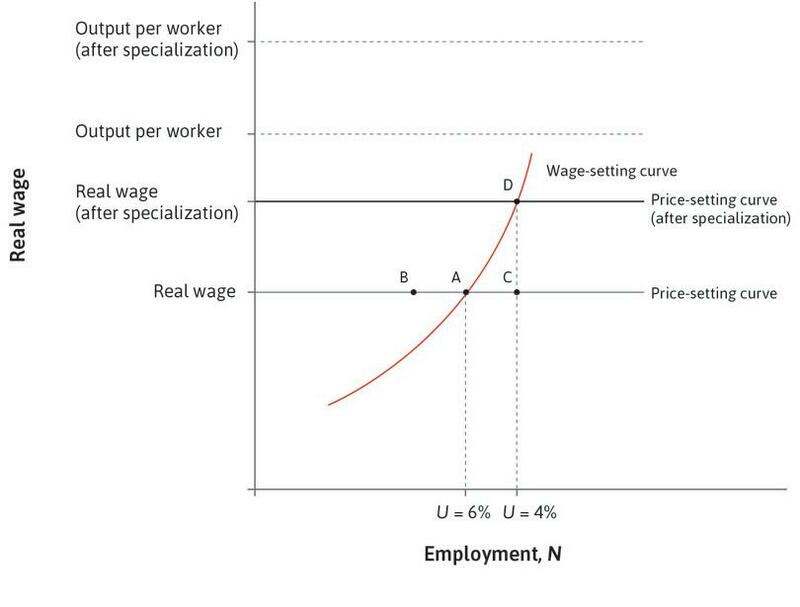 This process stops when the economy has come to the new intersection of the price- and wage-setting curves at point D.
Figure 18.21e The demand increases workers’ bargaining power. Wages increase. This process stops when the economy has come to the new intersection of the price- and wage-setting curves at point D.
It may also shift if workers demand more generous unemployment benefits because of the increased job turnover due to the effects of trade. If it shifts a lot, specialization might imply a reduction in total employment. For example, at point E in the figure, unemployment is higher than the original long-run rate of 6%. Figure 18.21f It may also shift if workers demand more generous unemployment benefits because of the increased job turnover due to the effects of trade. If it shifts a lot, specialization might imply a reduction in total employment. For example, at point E in the figure, unemployment is higher than the original long-run rate of 6%. However, if there were only a modest shift in the wage-setting curve, employment would have risen as a result of specialization, as shown by point F.
Figure 18.21g However, if there were only a modest shift in the wage-setting curve, employment would have risen as a result of specialization, as shown by point F.
When the economy has come to the new intersection of the price- and wage-setting curves, will the US economy now employ more or fewer workers than before? 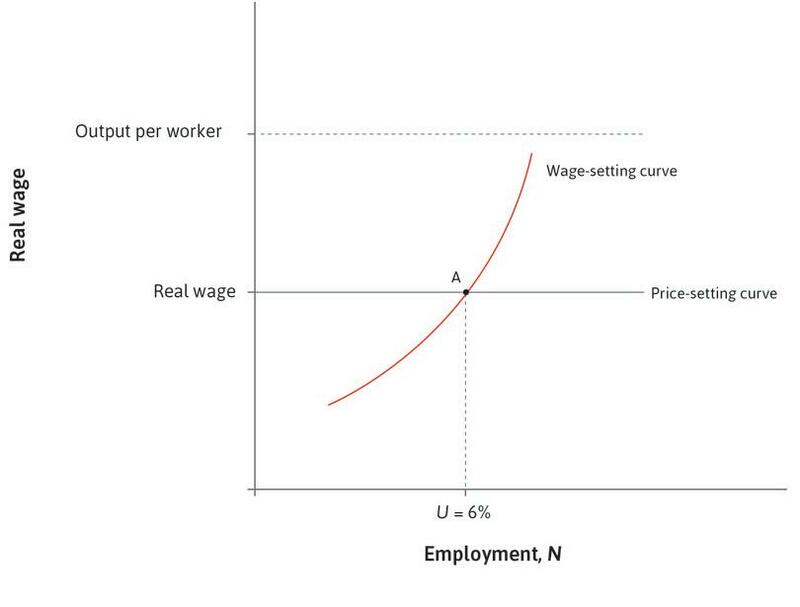 As shown in the analysis in Figure 18.21, the answer depends on the change to the wage-setting curve. Historically, in many countries, integration into the world economy was accompanied by unemployment in some sectors of the economy. In addition, economic fluctuations due to international price changes produced variations in cyclical unemployment. The result was an increase in voters’ demands for more adequate unemployment insurance policies, and a strengthening of employment protection and other policies to protect households from shocks to income and employment. Voters supported these policies for the same reason that households seek to smooth consumption. These effects would shift the wage-setting curve up. As we saw in Unit 17, in the era after the Second World War, many countries integrated their economies into the world economy and at the same time developed income-smoothing policies, commonly termed the welfare state. In Nordic countries, for example, trade unions agreed to unimpeded imports. In return they won support for unemployed workers, and policies to retrain workers displaced by imports increased. The rapid growth in world trade among the high-income countries following the Second World War took place alongside the development of the welfare state and falling inequality. Unemployment remained low during this period, as we saw in Units 16 and 17. Specialization in this period was based on trade among quite similar countries—US and western European economies, for example—and it rested to a considerable extent on economies of scale and agglomeration economies. Much of it was so-called intra-industry trade where countries were trading similar goods (exporting and importing different kinds of cars and commercial vehicles, for example, as in Exercise 18.7). The process of specialization created winners and losers—including winner companies like BMW and Ford, and entire winner industries like machine tools in Germany and aircraft production in the US, benefiting owners and employees alike. And, unlike specialization based on factor endowments, trade based on economies of scale does not separate out the winners and losers according to the factor of production that is the main endowment on which a person’s income depends (for example labour or capital). The renewed growth of global integration following the collapse of the Soviet Union and the opening up of China to trade from the early 1990s has been accompanied by rising inequality in many high-income countries, along with geographically concentrated job losses in labour markets affected by imports from China. For these particular displaced workers it was not much reassurance to know that a new equilibrium would eventually be reached in which workers would on average be better off. With the help of the labour market model in Figure 18.21, we can see the common features of a trade shock and a technology shock. In Section 16.7, we contrasted the benefits of these shocks in the very long run with the costly adjustment as jobs are lost before new ones are created in different industries (and locations). The evidence reported there from the ‘China shock’ that began in the early 1990s highlighted that job losses were concentrated geographically and persisted for decades. Tennessee, which specialized in furniture, suffered massive, long-lasting job losses, while nearby Alabama, which produced goods that were not exported by China, did not. Figure 18.21 is the long-run labour market model for the US as a result of specialization according to its comparative advantage. The US has a comparative advantage in the production of capital-intensive aircraft, while China, its trade partner, has a comparative advantage in the production of labour-intensive consumer electronics. Before trade, the German labour market equilibrium is at A. Which of the following statements are correct? As a result of specialization, at first both worker productivity and the total employment level rise. With the rise in productivity, the firms expand employment resulting in a lower unemployment rate. With lower unemployment, workers demand higher wages for high effort, resulting in a higher price-setting curve. The wage-setting curve rises if workers demand unemployment insurance as a result of globalization. Then the long-run employment level is unambiguously lower than at A. The productivity rises as production shifts to more capital-intensive good. However this means that fewer workers are employed per unit capital, resulting in a fall in the total unemployment. On the diagram the economy moves from A to B. With more productive labour the firms invest in productive capacity, re-employing former consumer electronics workers. Yes, workers move along and up the wage-setting curve until it meets the higher price-setting curve. If the rise in the wage-setting curve is modest then the long-run employment level may be higher than at A (for example at F). Just as the Italian farmers had not been happy to see the cheap Indian grain being offloaded from the steamer Manila in Genoa, workers in North America did not always welcome Europeans in search of a more affluent life, like the 69 passengers sailing west on the Manila after leaving Genoa on their way to New York. Immigration hurt unskilled workers in the New World. Where unskilled wages lagged furthest behind average incomes, immigration barriers were raised the most. This resulted in another type of globalization backlash during the first period of globalization in the nineteenth and early twentieth centuries: gradually rising barriers to immigration. In Unit 9, we analysed the effect of immigration on unemployment (see Figure 9.18). The model helps us to see why opposition to immigration was common among workers in land-abundant economies like the US or Canada at that time and in many countries since. When new people arrive in a nation they are unemployed, so we might expect the first impact of immigration to be that it increases unemployment. This means that immigration also increases the cost of job loss for residents, because the worker who loses a job is now in a larger pool of unemployed workers. Workers have more to fear from losing their jobs, and firms will be able to make employees work effectively at a lower wage. This is not the end of the story. Firms are now getting work at lower wages, and so are more profitable. As a result they will seek to expand production. To do this, they will invest in new machinery. This will increase labour demand in the rest of the economy, and when the new capacity is ready, firms will hire more workers. Return to the analysis in Figure 9.18 to follow the steps from the impact effect to the long-run outcome. In this story, the short-run impact of immigration is bad for existing workers in that country: wages fall and the expected duration of unemployment increases. The short run may last for years or even decades. In the longer run, the increased profitability of firms leads to expanded employment that eventually will restore the real wage and return the economy to its initial rate of unemployment (if no further changes in the situation take place, like another wave of immigration). As a result, incumbent workers are no worse off. Immigrants are likely to be economically better off too—especially if they left their home country because it was difficult to make a living. The economic effects of immigration are widely debated among the public. 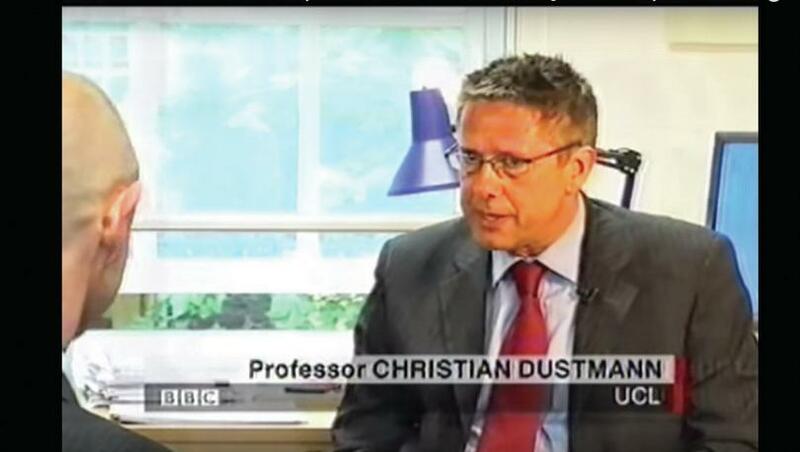 This interview from 2006 with Christian Dustmann, an economist who specializes in the effects of migration, captures this debate—in particular the impact of migrant workers on the British town of Swindon. Summarize the evidence on migrants’ skills suggested in the video. Use the labour market model to show what may happen to wages and employment after an influx of migrant workers. What is the evidence on the effect of immigration on wages in Britain reported in the video? Compare this with your prediction from question 2. Try to modify the price- and wage-setting model to come up with an explanation of this evidence. As the nineteenth-century examples of European agricultural protection and New World immigration restrictions show, globalization can under­mine itself. It produces winners and losers. We have seen that by allowing countries to specialize, globalization of trade in goods and services can expand the consumption possibilities of all nations. But the freer movement of capital around the world in search of profit-making opportunities also allows businesses to seek countries with lax environmental regulation and low taxation or where workers do not have rights to organize in trade unions. So governments that wish to attract overseas investments are often under pressure to oppose policies that would address problems of environmental sustainability and economic justice. The freer movement of goods and capital, as we saw in Units 13 to 15, also limits the effectiveness of policies to stabilize aggregate demand and employment. The movement of labour from one country to another creates gains for some, but threatens losses for others. If the losers, whether from the mobility of goods, investment or people, are ignored, globalization may turn out to be politically unsustainable in a democracy. Hyperglobalization: A world in which there are virtually no political or cultural barriers to the location of goods and investment. Democracy within nation states: This means (as we said in Unit 1) that the government respects both individual liberty and political equality. National sovereignty: Each national government can pursue policies that it chooses without any significant limits imposed on it by other nations or by global institutions. As an example of one of the tensions among these objectives, according to Rodrik, hyperglobalization means that countries have to compete with each other for investment, with the result that wealth owners will seek locations for their investments in which labour has fewer rights and the environment is less protected. This makes it difficult for national governments to adopt regulatory standards or other policies, or raise taxes on mobile capital or highly paid workers, even when citizens think that fairness requires this. Implementing hyperglobalization may be impossible in a democratic society. The outcome may therefore either be the demise of hyperglobalization (top row of Figure 18.22) or the demise of democracy (middle row). Figure 18.22 illustrates the three possible outcomes of Rodrik’s political trilemma. Figure 18.22 Rodrik’s political trilemma. Adapted from Dani Rodrik. 2012. The Globalization Paradox: Democracy and the Future of the World Economy. United States: W. W. Norton & Company. Let us take each row of the table in turn to clarify the trade-offs. Hyperglobalization is ruled out (top row): This happens if national sovereignty and democracy at the national level endure. The reason is that there have to be limits on labour and capital mobility in order to deliver effective national policies of stabilization, environmental sustainability, and redistribution that will be demanded by a democratic electorate. Democracy is ruled out (middle row): Hyperglobalization policies can only be implemented by the national government if the citizens’ opposition to them is weakened by a dilution of democratic processes. 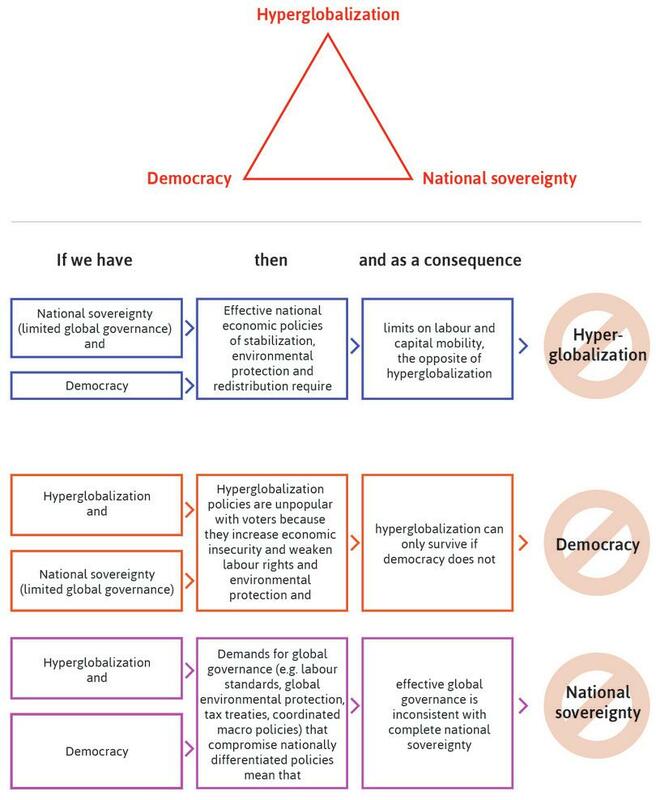 National sovereignty is ruled out (bottom row): If hyperglobalization policies are accompanied by supranational institutions that can prevent a race to the bottom in environmental and labour standards, for example, and therefore gain democratic support, this restricts the ability of countries to choose national policies independently. A way of understanding the bottom row is to think of existing arrange­ments in a federation like the US or Germany. There is free flow of goods, investment, and people across states of the federation. The race to the bottom is prevented by federal legislation and by democratic elections at federal level. This restricts the ability of the states to implement policies that would interfere with the benefits of ‘hyperglobalization’ across the whole country, with the protection of standards and the operation of stabilization policy. A second example is the political integration of Europe over the last few decades. It happened, in part, so that governments could obtain the benefits of free trade, plus the free movement of capital and labour, while retaining some ability at the supranational EU-wide level to regulate profit-making in the interests of fairness and economic stability. The obvious problem is how to make sure that this EU-wide or global governance is democratic as well as technocratic, and to allow voters to change the system if they don’t like it. Other supranational governance initiatives include world agreements on climate change, and efforts by the International Labour Organization to require that all nations meet at least minimal standards for the treatment of labour (eliminating child labour or the physical coercion of employees, for example). Dani Rodrik explains in our ‘Economist in action’ video that economics is a science of trade-offs, and that we can have too much globalization. His ‘Globalization Trilemma’ shows that when economies are increasingly globalized, they must ‘give up some sovereignty or some democracy’. 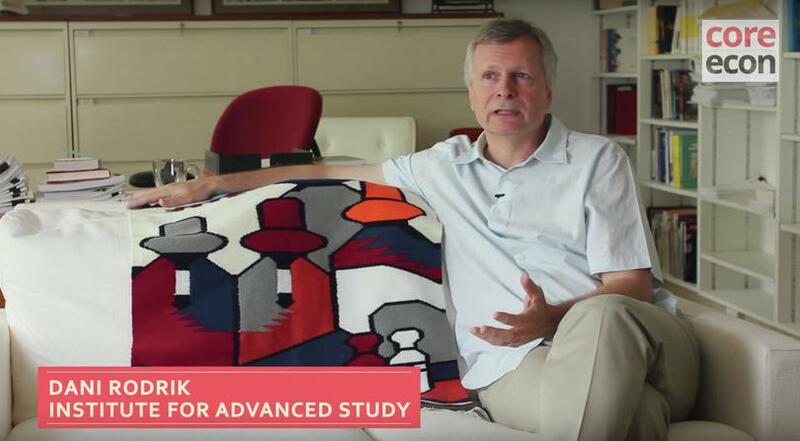 Watch Dani Rodrik’s ‘Economist in action’ video. According to the video, what are some of the benefits and trade-offs due to globalization? State some historical examples of the policy trilemma that were given in the video. The popular support that led to the election of Donald Trump as president of the US in 2016. The popular support that led to the vote in 2016 for ‘Brexit’, that is, for the UK to leave the European Union. We each have our own fancy. Not believing that we are saved already, we each should like to have a try at working out our own salvation. We do not wish, therefore, to be at the mercy of world forces working out, or trying to work out some uniform equilibrium according to the ideal principles, if they can be called such, of laissez-faire capitalism … We wish for the time at least … to be our own masters and to be as free as we can … to make our own favourite experiments towards the ideal social republic of the future. The nation-state is just about through as an economic unit … It is too easy to get about. Explain in your own words Keynes’ case in favour of ‘national self-sufficiency’ and Kindleberger’s claim that ‘the national state is … through’. Seal the national borders and withdraw from the world economy! Let trade, immigration, and investment across national boundaries take place in the absence of government regulation of any kind! Competition: Limiting the impediments to trade in goods and services among nations increases the degree of competition faced by firms in the local economy. This means that firms that fail to adopt new technologies and other cost-cutting methods are more likely to fail and to be replaced by more dynamic firms. The result will be an increase in the rate of technological progress. The size of the market: A firm that can export to the world market has the opportunity (if it can meet the competition) of selling far more than it could were it restricted to the domestic market. This allows lower-cost production, which benefits home-economy buyers, employees, and owners of these successful firms, as well as external buyers. Learning by doing in infant industries: In addition to economies of scale, another factor contributing to cost reductions is termed learning by doing. Even if the firm never achieves large-scale production, costs of production typically fall over time. Tariffs protecting infant industries can give firms the time and possibly the scale of operation necessary to become competitive. Disadvantageous specialization: For reasons of history, some countries may specialize in sectors where there is a lot of potential for innovation, whereas others specialize in sectors with little such potential. Many Latin American countries, for example, slowed growth by specializing in low-innovation sectors such as natural resource extraction. Developing new specializations may require direct government intervention, including infant industry protection. It is clear from Figure 18.23 that during the second period of globalization, workers in some countries—China and South Korea for example—have seen rapid increases in their income levels. But the same figure also makes it clear that in other countries, such as Mexico and Sri Lanka, workers have seen few benefits from the increasingly integrated world economy. Catching up and stagnating: Manufacturing wages relative to the US (1950–2015). Figure 18.23 Catching up and stagnating: Manufacturing wages relative to the US (1950–2015). (1) Andrew Glyn. 2006. Capitalism Unleashed: Finance, Globalization, and Welfare. Oxford: Oxford University Press; (2) National Bureau of Statistics of China. Annual Data; (3) Bank of England; (4) US Bureau of Labor Statistics. 2015. International Labor Comparisons. Note: Annual US BLS data for Mexico, the Philippines and Sri Lanka has been smoothed using a backward-looking five-year moving average. Early protectionism in Germany and the US: These countries developed modern manufacturing sectors behind high tariff barriers that sheltered them from British competition. In the late nineteenth century, the correlation between tariffs and economic growth across relatively rich countries was positive. In particular, higher manufacturing tariffs were associated with higher growth. During the interwar period, tariffs were also positively correlated with growth. Scandinavian prosperity through openness: These countries have been very open to trade for more than 100 years and have prospered. So as to mitigate the fluctuations in household income associated with changes in international prices, they also have high tax rates to support generous social insurance and subsidies for retraining. Picking national winners: Many East Asian governments have promoted trade while influencing its pattern by favouring certain industries, or even certain firms, and by directing firms to compete in export markets whilst providing some protection from import competition. Two directions after 1945: On the one hand, countries in East Asia that encouraged their firms to compete in international markets grew faster than Latin American countries that were more closed to international trade. On the other hand, after those Latin American countries reduced their tariffs in the early 1990s, their subsequent economic growth rates were lower than during the more closed period 1945 to 1980. If there is a lesson from this, it is that success does not depend on whether a country is more or less integrated into the world economic system—more or fewer exports and imports, for example, or a greater amount of international investment by its firms—but rather on how well economic integration is managed by policies that promote growth. It was once thought that if countries were identical none would have a comparative advantage in the production of any good, and there would be no reason for them to specialize and to exchange goods. For example, Eli Heckscher (1879–1952) and Bertil Ohlin (1899–1979) reasoned that, when accounting for comparative advantage and trade, the key differences between countries were the relative scarcity of land, labour, or capital. Canada and the US had abundant land relative to the amount of labour, and hence would specialize in and export agricultural goods. With more capital and less labour than China, Germany would export capital-intensive goods to China. Based on the Heckscher–Ohlin theory he expected that, because the US was the most capital-abundant country in the world when measured by the stock of machinery, buildings and other capital goods per worker, its exports would be capital-intensive and its imports labour-intensive. He found the opposite. For more than 50 years, economists have struggled to resolve this so-called Leontief paradox. Leontief speculated that the US might be labour-abundant if instead of simply measuring the quantity of employees, we include cultural and organizational factors that support a high level of effective work per employee. While his hypothesis has not yet been adequately tested empirically, it reminds us that culture and institutions may be an essential part of explaining how an economy works and may be a source of comparative advantage. The empirical evidence on how trade affects growth is mixed. How would you measure openness to trade (tariffs, export ratios, or other indices of openness)? Discuss the advantages and limitations of your chosen method. Explain the problems you would face in designing a convincing study. Hint: think back to the examples given in Section 1.9, the introduction to Unit 13, and Section 14.7 about the ways that it is sometimes possible to establish that something (like trade, in this example) causes something else (like growth or lack of growth). The world’s economies are now part of an integrated global system. Major companies consider the entire world when deciding where to produce and where to sell their goods and services. Investors, likewise, choose where to hold their assets, whether financial or real, on the basis of calculations of expected returns after taxes in all the regions of the world. But we have also seen that labour has for the most part not been globalized, and for political, cultural, and language reasons remains largely national. National borders remain an essential fact of the global economy. National governments remain major actors in affecting the course of their own and other economies. Globalization has brought about important changes. In the eighteenth century, at the birth of economics as a discipline, goods were traded across national boundaries, and investments were made in far-flung parts of the world; but for the most part the nation and its economy had the same boundaries. The world today looks quite different. Trading of goods and services and investment are now integrated into the world financial system in which transactions are made electronically in milliseconds. Economists can help to design and evaluate policies that secure the greatest possible mutual gains among the world’s people participating in this new dynamic and cosmopolitan economy. They can also identify groups whose livelihoods are under threat from the globalization process and propose policies to ensure that the gains made possible from worldwide investment and exchange are fairly shared. Ricardo, David. 1815. An Essay on Profits. London: John Murray. Rodrik, Dani. 2012. The Globalization Paradox: Democracy and the Future of the World Economy. United States: W. W. Norton & Company. Paul Krugman. 2009. ‘The Increasing Returns Revolution in Trade and Geography.’ In The Nobel Prizes 2008 , edited by Karl Grandin. Stockholm: The Nobel Foundation.